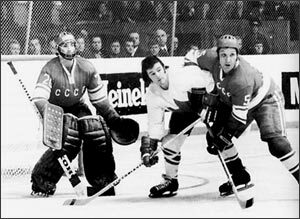 Team Canada 1972 has lost one of its fiercest competitors, with the announcement that Vladimir Petrov has died at the age of 69. 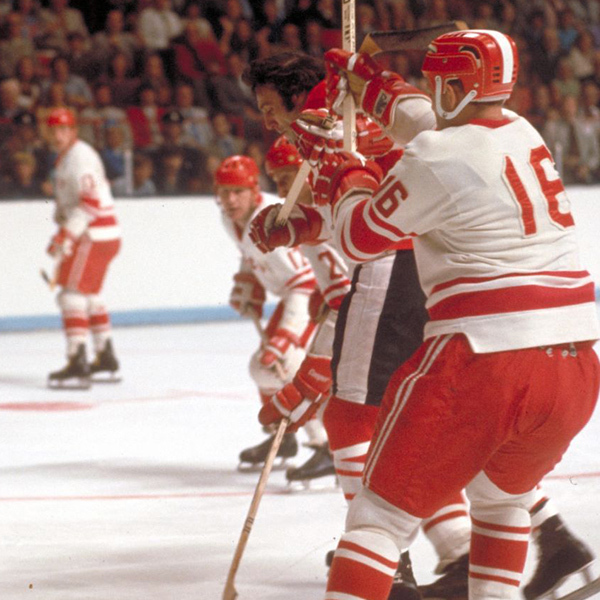 (Petrov, number 16, can be seen above battling Phil Esposito in front of the Soviet net.) 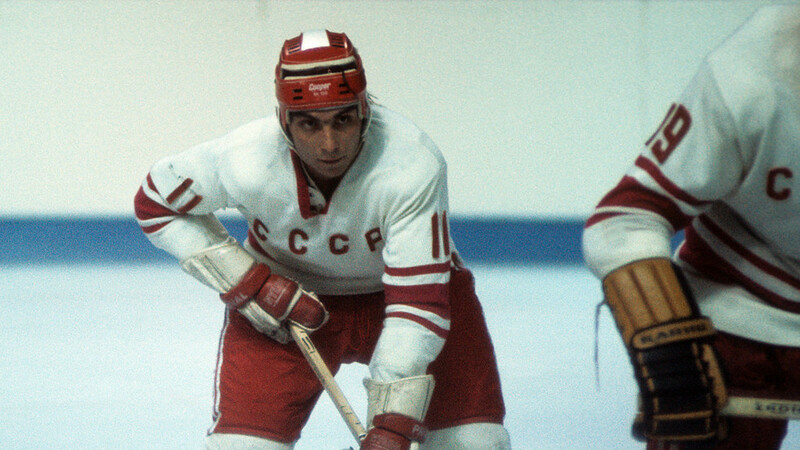 The team sends it condolences to his family and to the surviving members of the 1972 Soviet National squad. For some insight into Vladimir's career, check out his Wikipedia page. 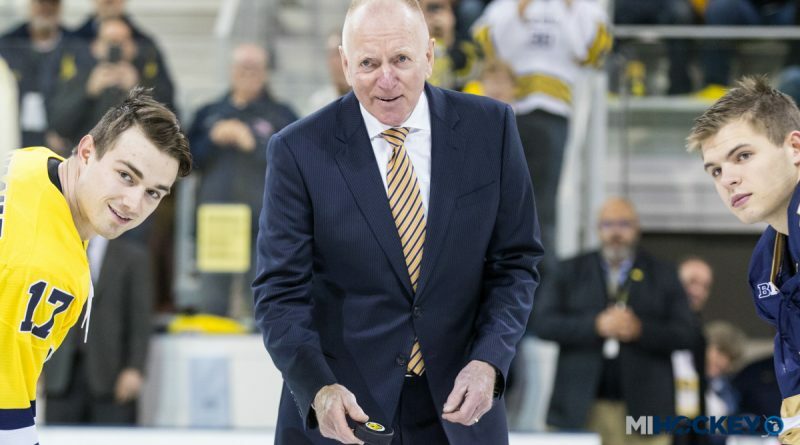 Red was honoured for his 33 seasons of coaching Michigan hockey when the Red Berenson Rink was officially dedicated in his honour on Friday, January 5. 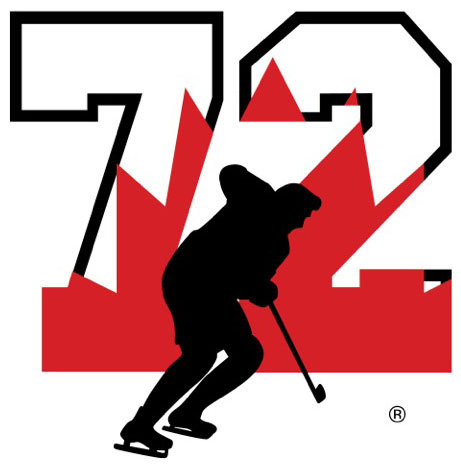 Red will join a growing list of arenas named in honour of Team Canada 72 members. There are likely more but we are aware of Arena Olympia Yvan Cournoyer and Centre Marcel Dionne which are both in Yvan and Marcel’s hometown of Drummondville, Quebec. There is also the Amphitheatre Gilbert-Perreault in Victoriaville, Quebec. In Faribault, Minnesota you will find The Shattuck-St. Marys Jean-Paul Parise Arena recognizing JP’s 12 years guiding their hockey program. The city of Mississauga named an arena after Paul Henderson to thank Paul for his charity work in the Mississauga area where Paul now resides. We also have the Bobby Orr Community Centre in Bobby’s hometown of Perry Sound, Ontario. You can also find the Arena Rodrique-Gilbert in Montreal, Quebec. Our apologizes to any player that we have missed. 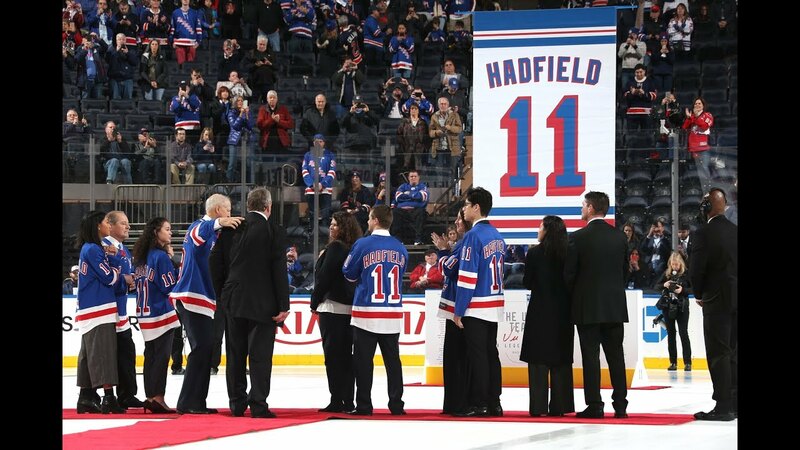 We all watched with great pride as teammate Vic Hadfield’s number 11 was retired by the New York Rangers and will remain for all eternity in the rafters of Madison Square Garden alongside the other legends of Rangers’ history including his great friends and New York Ranger linemates and Team Canada teammates Jean Ratelle and Rod Gilbert. We hope that before long Ranger teammate and Summit Series Most Valuable Defenseman Brad Park will be joining those hallowed rafters. Here are some comments from the New York Post’s Larry Brooks: Hadfield did it all through 13 years and 841 games as a Blueshirt. He did it with his fists that he threw down in a series of memorable fights in the penalty box with Henri Richard and he did it with gnarled hands that were good enough for him to become the first 50-goal-scorer in franchise history in 1971-72. He did it with leadership abilities he used as captain in the run to the 1972 final. He did it with wit, humour and personality. “Oh, he was a leader, all right,” said Emile Francis. “He was the right guy to take over as captain [after Bob Nevin was traded following the 1971 playoffs]. I didn’t even think of anyone else. He was the type of individual that his teammates would follow. He garnered respect right away in this league. 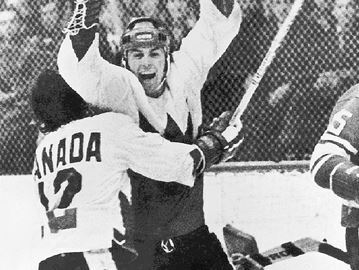 There was nothing he wouldn’t do for his teammates.” The members of Team Canada 1972 pass on their congratulations to Vic and his family. Besides Rod Gilbert, Jean Ratelle and Brad Park, Team Canada 72 teammates Rod Seiling and Red Berenson also played with Vic in the Big Apple. Don Awrey was a teammate of Vic’s with the Pittsburgh Penguins as was the late Gary Bergman with the Buffalo Bisons. Vic shared his junior hockey days in St. Catharines with the Teepees with Pat Stapleton and the late Stan Mikita winning a Memorial Cup with Pat in 1959-60. December 14 was a very memorable date for three members of Team Canada 1972, Bobby Orr registered his first hat trick in 1968, Tony Esposito earned his first career NHL shutout also on the same day in 1968 and Marcel Dionne tallied his 500th NHL goal on this day in 1982. Bobby Orr scores three goals for his first NHL hat trick in the Boston Bruins' 10-5 win against the Chicago Blackhawks at Boston Garden. Orr, 20, scores twice in the first period and once in the second. Each of the three goals is set up by a lead pass from forward Ed Westfall, who also has a goal and keeps Chicago's Bobby Hull off the scoresheet. Orr also has two assists, the second on Westfall's third-period goal. Orr gets his hat trick midway through the second period, beating goaltender Dave Dryden from 35 feet. He receives an 80-second standing ovation and more than 50 hats are tossed onto the ice. Orr misses the chance for a fourth goal by shooting wide of an open net in the third period. 1968: Tony Esposito earns his first NHL shutout by making 25 saves for the Montreal Canadiens in a 1-0 victory against the Philadelphia Flyers at the Spectrum. It's one of Esposito's five wins with the Canadiens, who lose him to the Chicago Blackhawks in the 1969 intraleague draft; he wins 418 games with Chicago before retiring in 1984. He is inducted to the Hockey Hall of Fame in 1988. 1982: Marcel Dionne becomes the ninth player in NHL history to score 500 goals. The milestone comes when his second of the game gets the visiting Los Angeles Kings even with the Washington Capitals at 2-2. But the Capitals score five unanswered goals for a 7-2 victory. Cournoyer learned much on, off ice from Beliveau Canadiens captain from 1975-79 still reveres legendary predecessor by Dave Stubbs @Dave_Stubbs / NHL.com Columnist MONTREAL -- It has been four years since the death of Montreal Canadiens icon Jean Beliveau, four years since Yvan Cournoyer, a fellow 10-time Stanley Cup champion and Hall of Famer with the Canadiens, stood at the altar of Mary, Queen of the World Cathedral on Dec. 10, 2014 and eulogized his dear friend. "Oh captain, my captain … bon voyage," Cournoyer said that day, his voice tight with emotion during Beliveau's nationally televised funeral. Cournoyer was visiting the Canadiens' seventh-floor executive offices at Bell Centre during a game against the Boston Bruins on Dec. 17. 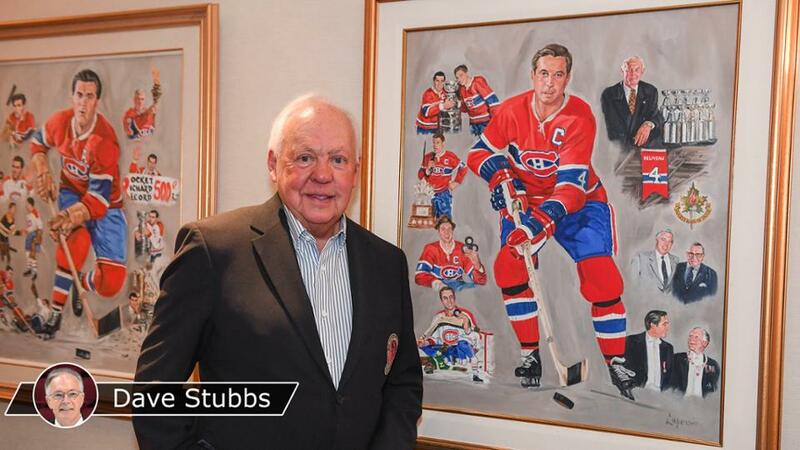 It was the second intermission, and having for a short time left the guests he had brought to the game, he was standing between large oil paintings of Beliveau and Maurice "Rocket" Richard. There is a canvas of each of the Canadiens' greatest players on this floor; those of Richard and Beliveau, respectively captains from 1956-60 and 1961-71, are framed side by side. The painting of Cournoyer, captain from 1975 until his retirement in 1979, is a few dozen steps down the hall. "It doesn't seem like four years. 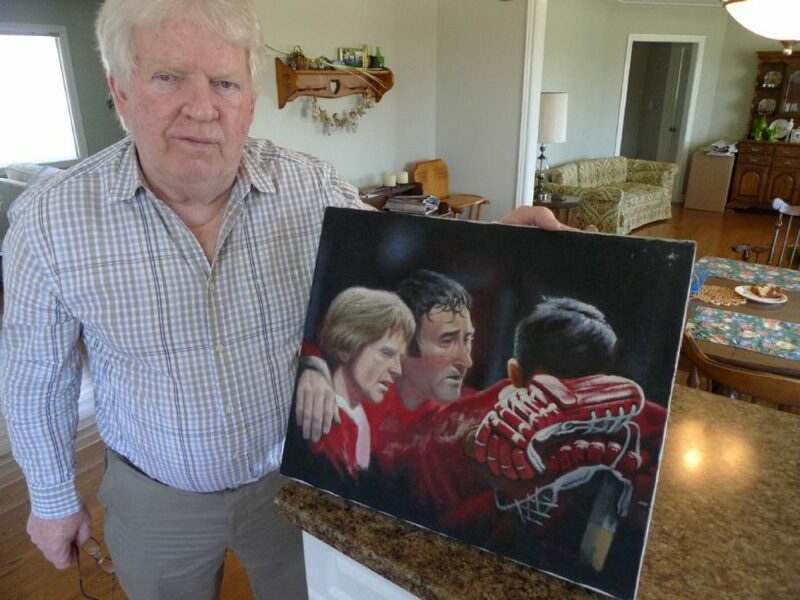 A couple of years maybe," Cournoyer said, studying Beliveau's portrait. "Jean always told me, 'Time goes so quickly.' When I arrived in the NHL I was 20 and he was 33. He was like a father to me. I laced my skates in the dressing room beside him. We were roommates on the road. "I have so many memories, and when Jean passed away all the memories came back. Long after we retired it was always nice to see him because he was always asking, 'How's everything? How are you doing? Is everything fine?' He always kept himself informed about what we were doing. It was always a nice conversation with Jean. We could always talk." Cournoyer was one of the last Canadiens to visit Beliveau at the his Montreal-area home before his death Dec. 2 at age 83 following a lengthy illness. Cournoyer was devastated, inconsolable after the visit, at Beliveau's public visitation at Bell Centre on Dec. 7-8, as a pallbearer and eulogist at the funeral, and for long afterward. But time has softened the loss, and today Cournoyer's memories are warm and painless, even if he still finds himself, like so many, wanting to pick up the phone just to hear Beliveau's familiar baritone. "There were so many things about Jean," said Cournoyer, 75. "When he was talking in the room, and it wasn't that often, he was always positive, in the right way, never negative and never loud. He'd eat with us on the road or go for a quiet drink. He liked to have fun, and he liked to talk hockey a lot. "Jean was very special as our captain. He always said to us, 'The hockey season is very long but if you have something that doesn't go well in the summer, I'm always available. Just call me and we'll figure out what we need to do. And if you have good things happening in your life, call me too. I'm there all year-round, not just during the hockey season.'" For years there was a single portrait of Beliveau in the small foyer inside the Canadiens' Bell Centre alumni lounge, a dressing-room photo that captured the eye and the imagination every time you left. Last season two more portraits joined it: Cournoyer in the middle, Guy Lafleur on the right. "It's wonderful to see us together, especially in black and white," Cournoyer said with a laugh. "We had tough times sometimes, but we always came out of them together. It wasn't easy all the time. Everyone says, 'You won all the time.' Well, if we did, it was for a reason. "I learned so much from Jean. He always believed that if you have something to talk about, if something goes wrong, don't wait. He'd say, 'Let me know right away. The more we wait, the worse it will be.' When I became captain, I knew if there was something wrong I'd have a meeting on the road right away and we'd talk about it." And that thought had Cournoyer smiling about an event during the 1966 Stanley Cup Final, his second NHL season. "Detroit had beaten us two straight games at home (3-2 and 5-2)," he said. "Jean wanted to have a team meeting on the road in Detroit to get a few things straight. He had to fight with (general manager) Sam Pollock to get about $400 for a team dinner. That was a big thing, to spend that amount for a team meeting. Jean got the money, we had the meeting, and we won four in a row to win the Cup (4-2 and 2-1 in Detroit, 5-1 back in Montreal and 3-2 in overtime in Detroit). That was something I'll always remember. I think it was worth the $400." 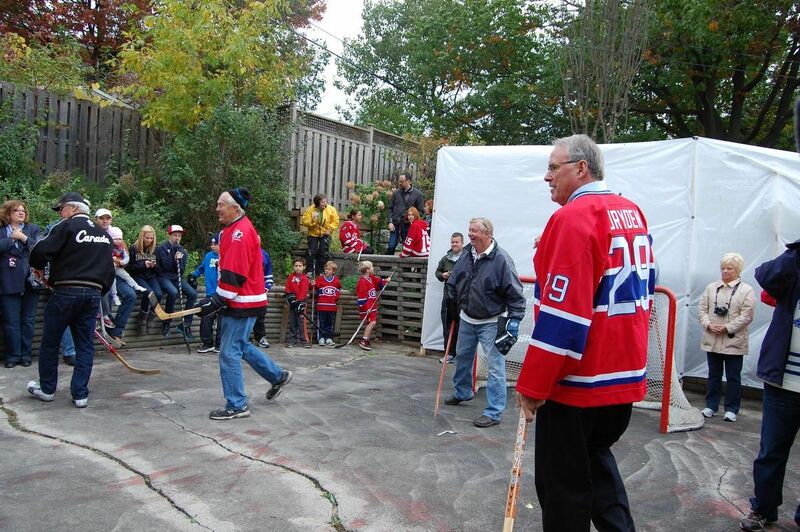 Like Beliveau was as a player and in retirement, Cournoyer is busy in the community. Each played every one of his NHL games for the Canadiens, cornerstone members of the organization. The mantle of elder statesman is Cournoyer's now and he embraces it. For many fans his cheerful face and strong handshake are reminders of the Canadiens' glorious era of the 1960s and 1970s, Montreal and Cournoyer winning 10 Stanley Cup championships between 1965-79. With Lafleur and alumni director Rejean Houle, Cournoyer is a team ambassador, a title he's had for almost 20 years. He makes a minimum of 25 official public appearances each season and another 15 or 20 with his own company. In truth, every time he steps out the door alone or with his wife, Evelyn, Canadiens fans view him, respectfully, as public property. "I need a schedule," Cournoyer said. "I need to work and I like to work. I've been working since I think I was 7 years old. I cleaned the ice at my rink, worked in the flower shop. For me, it's natural. Everybody in the grocery store says hello. I feel right at home. "I was leaving a store and a woman chased me across the parking lot to say, 'I have to shake your hand, you were my idol. I remember one game you fell two or three times but you got up and scored a goal.' Maybe it's because I played with no helmet and no visor. I look a little bit older but people still recognize me and I'm happy to say hello to everybody." If it all comes naturally, Cournoyer says it's because he learned well from Beliveau, who famously answered by hand every piece of fan mail that reached him from 1953, when he arrived in Montreal from Quebec City, through cancer treatment, using his experience to buoy other cancer patients, until 2010, when the first of two strokes left him unable to sign his name the way he believed fans deserved. Throughout our visit, Cournoyer flexed his meaty left hand, which was swollen because of a carpal tunnel problem he soon will have repaired surgically. "But I'm right-handed so I can still sign autographs," he joked, signing a few more in the alumni lounge for star-struck fans. Over his shoulder was the corner where Beliveau would sit when he attended Bell Centre games. The small couch has been replaced by a few chairs, where Beliveau's wife, Elise, their daughter, Helene, and their guests now gather between periods and until traffic has thinned out after the final siren. "There is no doubt that Jean's presence will always be felt in that corner, in this room and around the team," Cournoyer said, friendship and reverence blended as one. "Maybe the greatest compliment you could give him would be to say that he was a teammate. No matter how much we looked up to him, Jean was one of the guys because he wanted to be." 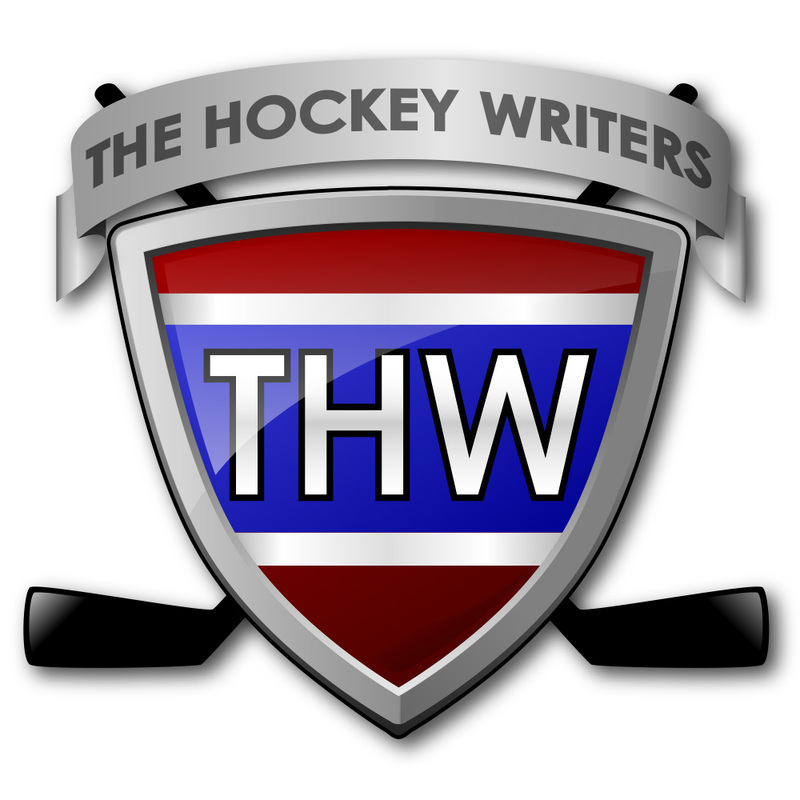 Jeff Seide from The Hockey Writers wrote an article chronicling the best player to ever play on each NHL team. Four Team Canada 72 players made this list: Bobby Orr (Boston), Stan Mikita (Chicago), Marcel Dionne (Los Angeles Kings) and Bobby Clarke (Philadelphia). Here’s what Jeff had to say about our Fab Four. Bobby Orr, Defense - Inducted into the Hockey Hall of Fame in 1979. Orr revolutionized the blue line position with a mix of speed, scoring and playmaking. He played 12 seasons in the NHL, all but two of them for the Boston Bruins. In both of his Stanley Cup Championships, Orr scored the game-clinching goal and was named the playoff MVP. He’s a nine-time All-Star, eight-time (consecutive) Norris winner, three-time Hart winner, two-time Smythe winner and is the only defenseman to win the Art Ross twice. 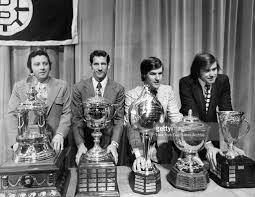 He also won the Calder Trophy in 1966-17 season and the Lester B. Pearson Award in 1974-75. He holds the record for most points (139) and assists (102) in a single season by a defenseman. In his NHL career, Orr played in 657 games, scoring 270 goals and 645 assists for 915 points. Stan Mikita, Center/Right Wing - Inducted into the Hockey Hall of Fame in 1983. While Bobby Hull holds the Blackhawks record for most goals, Mikita gets the nod for being their best player. Statues of both franchise players, who gained notoriety for being among the first to use sticks with curves blades, were installed outside the United Center in 2011. Stan Mikita began his NHL career at the age of 18. 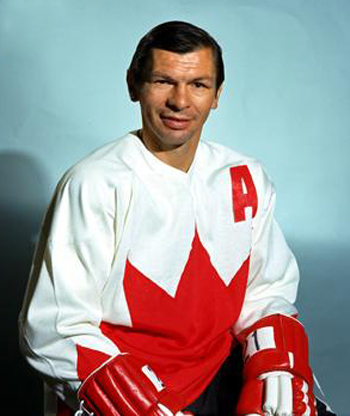 Known as “Stosh,” Mikita was generally regarded as the best centerman of 1960s. In his first few seasons Mikita was among the most penalized players in the NHL. He then drastically cleaned up his game and limited his penalties after he returned from a road trip and found out his daughter questioned why he spent to much time sitting down. He had been serving a ten-minute misconduct in the penalty box. In addition to winning the Stanley Cup in 1961, he won the Lester Patrick Trophy, is a two-time Hart Trophy winner, a two-time Lady Byng Trophy winner, and a four-time Art Ross Trophy winner. The eight-time All Star is the only player in NHL history to win the Hart, Ross, and Lady Byng trophies in the same season, doing so in consecutive seasons, in 1966–67 and 1967–68. After a game in 1967 in which an errant shot tore a piece off one of his ears, Mikita was one of the first players to wear a helmet regularly. He was able to have the piece of his ear stitched back on. League-wide, Mikita ranks 40th all-time in games played (1,396), 32nd in goals (541), 18th in assists (926) and 14th in points (1,467). 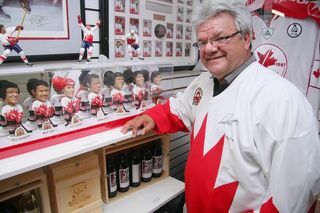 Marcel Dionne, Center - Inducted into the Hockey Hall of Fame in 1992. 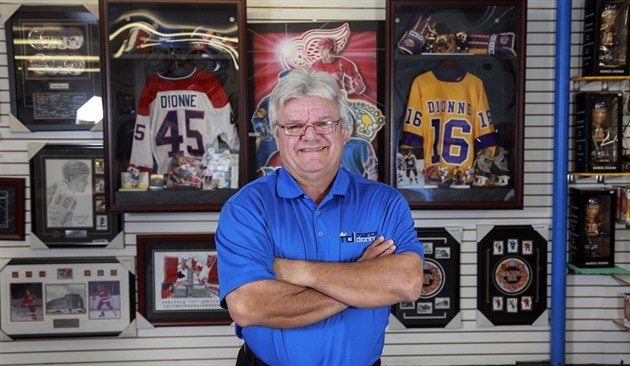 Dionne, all of 5-foot-9 and 190 pounds, was chosen by the Detroit Red Wings with the second overall pick of the 1971 NHL Amateur Draft. In his first season with the Wings, he set the NHL record for scoring by a rookie with 77 points. After four years, he was traded to the Kings and became their franchise player. Dionne centered the famous “Triple Crown Line” with wingers Charlie Simmer and Dave Taylor. In the 1979-80 season he tallied 137 points, tying Wayne Gretzky for tops in the league and won the Art Ross Trophy that year, besting The Great One by two goals. Dionne was a four-time All Star, two-time winner of the Lady Byng Trophy and Lester B. Pearson Award. He is third in the NHL for most 100+ point seasons (eight). He played 18 years in the NHL and ranks 52nd in career games played (1,348) played, fifth in goals (731), 10th in assists (1,040) and sixth in points (1,771). 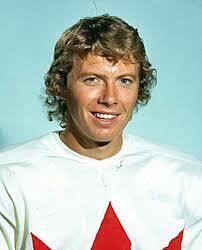 Bobby Clarke, Center - Inducted into the Hockey Hall of Fame in 1987. While a case could be made Hall of Famers Bernie Parent or Eric Lindros, the best Flyer to date is Bobby Clarke. Clarke played his entire 15-year career with the Flyers, leading them to the playoffs in 13 of those seasons. His accolades include two Stanley Cups, three Hart Trophies, plus Lester B. Pearson, Masterton and Selke awards. He had three 100-point seasons, twice leading the league in assists and played in eight All-Star Games. Clarke often centered Reggie Leach and Bill Barber, forming the LCB line. In 1975-76, the trio scored 141 goals–a record for most goals by a line. That year he had a plus-minus rating of plus-83 while amassing 119 points, setting a personal best and franchise record for most points in a single season. Among all NHL players, he ranks tied for 146th in games played (1,144), tied for 134th in goals (358), 25th in assists (852) and 44th in points (1,210). Michael Traikos (Montreal Gazette) We think Team Canada head coach Tim Hunter was being complimentary when he called Cody Glass the “Jean Ratelle of junior hockey today.” But first, we have to check back with our father. Or make that our grandfather. That’s how dated the reference was. For anyone under the age of 50, the point that Hunter was making was that Glass is a calm and collected playmaker who has the ability to make the difficult look easy. Think Joe Thornton or Nicklas Backstrom. Two years ago, Glass had 94 points in 69 games for the WHL’s Portland Winterhawks. Last season, the 6-foot-2 centre amassed 102 points in 64 games. He has since followed it up with a whopping 54 points in 26 games, including 42 assists. “He’s one of the most skilled guys on the team,” Hunter said of the Winnipeg native, who was cut from last year’s team because of a lack of size. “He’s much stronger than he was last year. He was too light last year to play on this team. He’s much more fit and much more stronger and able to fend off checkers and make the play that he needs to make.” As the first-ever pick of the Vegas Golden Knights in 2017, there is some pressure on Glass to grow into a franchise player for the new NHL franchise. But like Mark Scheifele, who was the Jets’ first pick after the franchise returned to Winnipeg, there is no sense in rushing his development. At 6-foot-2 and 185 pounds, Glass still has some growing to do. He knows that, which is why he wasn’t disappointed that he is in his fourth year in the Western Hockey League, while the three players selected right after him in the 2017 draft are all contributing in the NHL. “Another year of junior, another year of developing always helps in the long run,” said Glass, who had four assists in a 14-0 win against Denmark on Wednesday. “I think confidence-wise, I think I have just better capabilities of keeping my mind right. I think that’s the biggest thing. It’s a mental game out there too. Not everyone sees it, but obviously the game can be mentally frustrating for you. I felt like I’ve helped that stuff.” Sounds like something Jean Ratelle might say. by Chris Bradford (Pittsburgh Sports) ST. LOUIS -- Jack Johnson is and will always be a Michigan Man. Hockey, football, doesn't matter. You can tell that when you see Johnson walk around PPG Paints Arena or the Lemieux Complex in his navy blue ball cap with the maize 'M' on it. "I'm very proud and have nothing but great memories there," Johnson was saying following the Penguins' morning skate Saturday at the Enterprise Center. "I have lifelong friends that I was teammates with and classmates there. That'll never go away." One of those lifelong friends will be on hand tonight for the game against the Blues: Johnson's college coach, the legendary Red Berenson is dropping the ceremonial first puck as the Blues are honoring the 50th anniversary of Berenson's record six-goal game against Philadelphia on Nov. 7, 1968. Following his playing days, Berenson joined the Blues' coaching staff and later became head coach, winning the Jack Adams Award in 1980-81. In 1984, he became head coach at the University of Michigan where he guided the program for 33 seasons. Berenson won three national titles and is the NCAA's fourth all-time winningest hockey coach with 848 victories. Most importantly, according to Johnson, was that he inspired his players. Though born in Indiana, Johnson was raised in Michigan and dreamed of playing for Berenson. Nope, there was no hard recruiting sell on Johnson. When he was 10, he attended Berenson's hockey camp in Ann Arbor and even made a promise. "I remember raising my hand, when I was young and dumb and saying 'One day, I'm going to play for you,' " Johnson recalled. He did just that. After being drafted third overall by the Hurricanes in 2005, Johnson starred for Berenson for two seasons in 2005-06 and 2006-07. Johnson even went back to play that second season against the objection of then-Carolina GM Jim Rutherford, who ultimately dealt his top prospect to the Kings in September of 2006. "It was awesome, two of the best years of my life," Johnson said. "(Berenson's) a guy who's kind of done it all. I used to say if I accomplished half of what he did, I'd consider it a pretty good run. He was great, always encouraging and instilled a lot of confidence in us. He really emphasized being a student-athlete at the University of Michigan. A student first and athlete second. Everyone that's played for him, he's had a huge impact on everyone." In fact, Johnson said he is still working toward his degree at U-M in the summer. Two years ago he attended school on campus. The 31-year-old says he's about seven classes short of his degree in general studies. One summer, Johnson says he even went to the university's compliance office in a failed attempt to walk-on the football team. What position would have he played? He didn't know. He says he just wanted the chance to run out the tunnel in the iconic blue and maize uniform at Michigan Stadium. ON THIS DAY - JANUARY 1 - 1973: Team Canada 72's Bobby Orr ties an NHL record for defensemen with six assists in Boston's 8-2 win against the Vancouver Canucks at Pacific Coliseum. 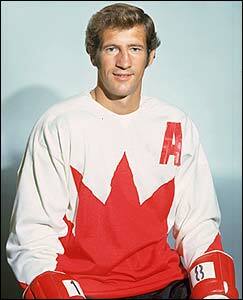 Orr ties the record set by Babe Pratt on Jan. 8, 1944 and matched by Team Canada 72's Pat Stapleton on March 30, 1969. Team Canada 72's Phil Esposito scores three goals and Johnny Bucyk becomes the first player to score 400 goals for the Bruins. 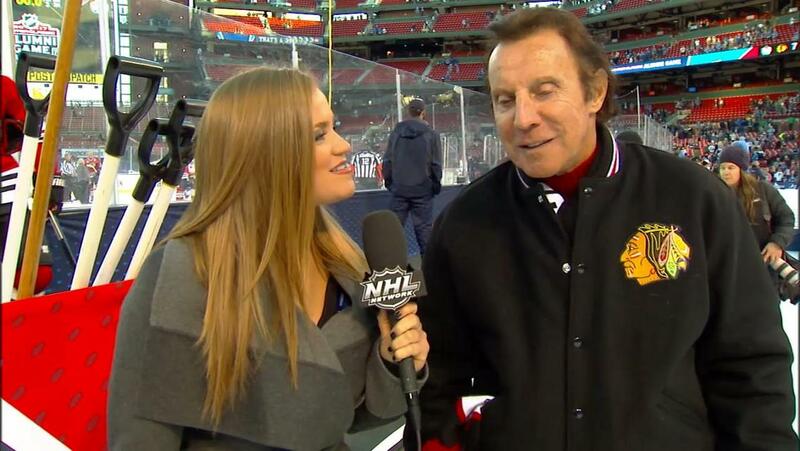 The Chicago Blackhawks honoured Tony Esposito at the 2019 Winter Classic at Notre Dame Stadium on January 1, 2019. January 4, 1973: Bobby Orr scores his 163rd NHL goal (in his 428th game), breaking the NHL record for career goals by a defenseman. Orr beats St. Louis Blues goaltender Jacques Caron at 19:25 of the second period to surpass the mark set Hockey Hall of Famer Red Kelly, who had scored 162 goals in 846 games as a defenseman. Despite Orr's milestone goal, the Bruins lose 4-2. DENNIS HULL HONOURED BY THE BLACKHAWKS WITH "ONE MORE SHIFT"
The Blackhawks honoured former forward Dennis Hull with “One More Shift” prior to the Monday, January 7, 2019 game against the Flames at the United Center. The Blackhawks’ “One More Shift” program is an ode to former players that allows fans to recognize them one more time as they skate on the United Center ice. Dennis took to the ice during the national anthem after starting lineups were announced. In-arena elements will also featured highlights of Dennis' career with the Blackhawks. In 13 seasons with the Blackhawks, Dennis scored 640 points (298 goals, 342 assists) in 904 games, the eighth-most games played in franchise history. Dennis was the second participant in the “One More Shift” program this season after current television color commentator and former forward Eddie Olczyk did so in November. Chicago has honoured several former players with “One More Shift,” including Bryan Bickell, Eric Daze, Troy Murray, Al Secord and Team Canada's late Stan Mikita last season. January 7, 1981: Marcel Dionne of the Los Angeles Kings scores two goals to become the 13th NHL player with 1,000 points. Dionne reaches the milestone in a 5-3 win at the Hartford Whalers, his 740th NHL game. At the time, he's the fastest to 1,000 points in NHL history. Thanks to the Hockey Hall of Fame for Ron's biography: Born in Lindsay, Ontario, an hour northeast of Toronto, the swift right winger gained his amateur training with the fabled Toronto Marlboros. He was a prolific scorer in junior and starred when the Marlies won the Memorial Cup in 1963-64. The young winger impressed coaches and fans in his first NHL season by scoring 23 goals and narrowly losing the Calder Trophy race to Detroit netminder Roger Crozier. He was immediately a vital two-way performer playing on a line with stalwarts Dave Keon and Bob Pulford. The veterans were impressed with the fact that the youngster's zeal was as strong while checking as it was when racing in on the opposition's goal. In 1966-67, he was one of the youthful troops that supported such legendary oldtimers as Red Kelly, Johnny Bower, Terry Sawchuk and George Armstrong. This gritty squad overcame a mediocre regular season to win the Stanley Cup. Ellis provided the crucial first goal in the sixth game of the finals versus Montreal, which the team won 3-1 to take the series in six games. Following the trade of Frank Mahovlich to Detroit, Ellis played on his most cohesive forward unit with Paul Henderson and Norm Ullman. This trio was adept at forechecking and opportunistic scoring. Ellis's role was crucial since he usually stayed back to guard against the counter attack while his linemates pushed forward. Prior to the 1968-69 schedule, former Maple Leafs great Irvine "Ace" Bailey insisted that Ellis wear his retired number 6 because he admired his high-caliber yet clean style of play. One of the young forward's greatest accomplishments wasn't resorting to rough or dirty tactics while doggedly checking such stars as Bobby Hull and former teammate Frank Mahovlich. Boston Bruins general manager Harry Sinden was another Ellis admirer. 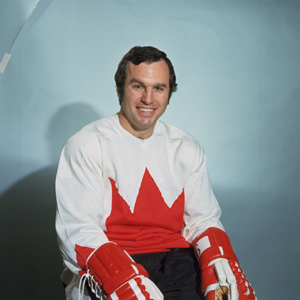 He was the impetus behind the Toronto winger's invitation to training camp when Team Canada 1972 was being assembled prior to the Summit Series against the Soviets. Despite a serious neck injury suffered in the opening game, Ellis played a strong checking role in all eight games of the series. Between 1966 and 1975, Ellis recorded nine straight 20-goal seasons, but the stress of the NHL grind became too great for him to bear and he retired after scoring 32 goals in 1974-75. During his two-year sabbatical, Ellis pursued a business career that enabled him to gain valuable experience away from the hockey rink. He also focused on the Christian faith, which had become an important part of his life. 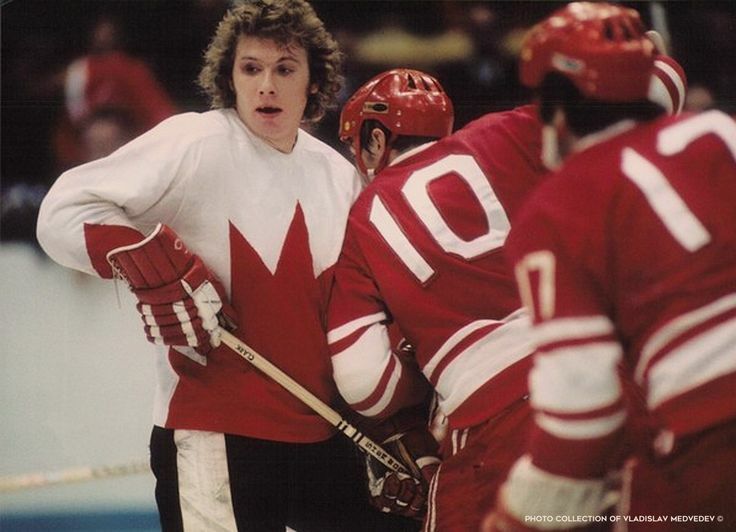 When Ellis first heard the news that Canadian professionals were eligible for the World Championship in 1977, he volunteered his services as a consultant. It turned out that he was asked to try out for the team, which he did successfully. Canada finished fourth, but many observers noted that Ellis played some of his best hockey in years. Feeling spiritually recharged, Ellis agreed to come to the Toronto Maple Leafs' training camp in 1977 under new coach and fellow Christian Roger Neilson. He reached the 20-goal mark for the team record of 10 straight years and helped the team reach the Stanley Cup semifinals for the first time since winning it all in 1967. The following year he lost 17 games to injury and the team began to disintegrate because of the destructive antics of owner Harold Ballard. One of the most distasteful incidents in the mismanagement of the Toronto team during this period occurred when Ellis arrived at Maple Leaf Gardens to find that his equipment was locked away and that his services were no longer needed. Following his retirement, Ellis continued to work in the business world and eventually returned to the game under the auspices of the Hockey Hall of Fame in 1992. His ability in public relations and involvement with the Hall's educational outreach programs have proven invaluable. January 9, 1981: Phil Esposito plays in his final NHL game, a 3-3 tie for the New York Rangers against the Buffalo Sabres at Madison Square Garden. 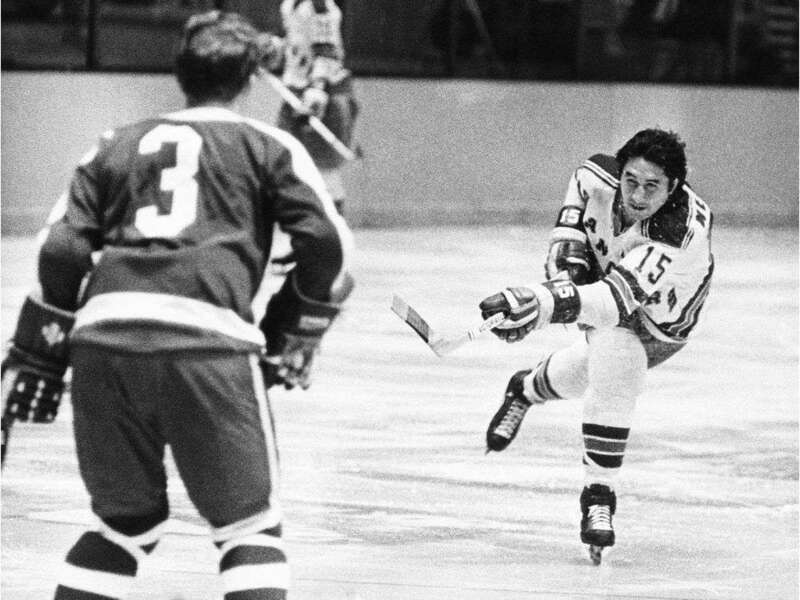 Esposito, 38, gets an assist on a first-period goal by Dean Talafous and retires with 717 goals and 1,590 points, second to Gordie Howe in each category. 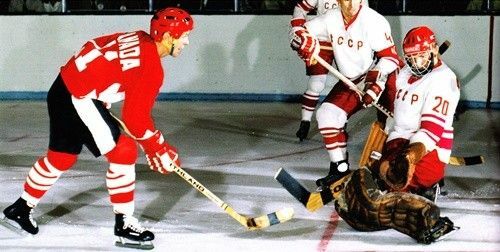 "PAUL HENDERSON HELMET" WAS ON MANY KID'S WISH LISTS - Former Canadien Sheldon Souray might have been the last NHL player to wear the CCM HT2 helmet that was made famous at 1972 Summit Series. by Stu Cowen/Montreal Gazette - There was a time in the NHL when helmets were more about “the look” than protection. The most cool helmet was the CCM HT2 model — better known as “the Paul Henderson helmet.” The really cool way to wear it was with the chin strap hanging well below the Adam’s apple and, of course, no visor. If you grew up playing hockey in the 1970s and you didn’t have a CCM HT2 helmet, you probably wish you did. I was lucky enough to have one. 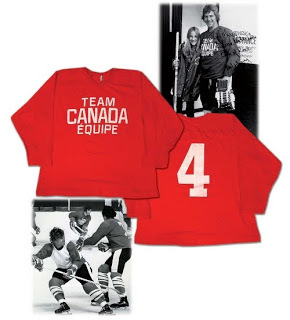 Henderson made the CCM HT2 model really popular after scoring the winning goal in the 1972 Summit Series against the Soviet Union while wearing it and then jumping into the arms of Yvan Cournoyer for one of the most famous photos in hockey history. It became by far the most popular helmet in the NHL after the league made them mandatory for incoming players starting with the 1979-80 season. But now the Paul Henderson helmet is gone from the NHL, replaced by newer models with better protection. All the helmets today basically look the same, whether they’re made by CCM, Bauer or Warrior, the three main companies. Former Canadien Sheldon Souray might have been the last NHL player to wear the CCM HT2 helmet. Gone are the days when a helmet was part of a player’s personality, whether it be the bubble “Stan Mikita helmet” made by Northland, Wayne Gretzky’s Jofa — which was basically a margarine bowl with a chin strap — Mark Messier’s big WinnWell model or the Snaps helmet Butch Goring received from his father as a 12-year-old and continued to wear throughout his 16-year NHL career, putting many coats of paint on it. 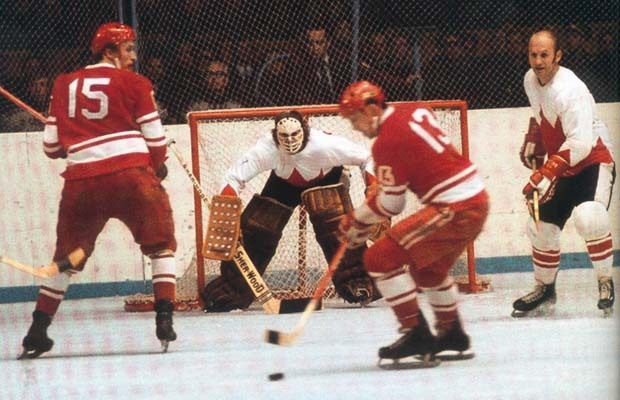 Henderson wore the CCM HT2 for the first time in March 1966 — when almost no NHLers wore a helmet — after suffering a bad concussion while playing with the Detroit Red Wings. “I was told I had to put a helmet on for the rest of the season,” Henderson recalled in a phone interview Wednesday from his home in Mississauga, Ont. “So they gave me a CCM helmet. I didn’t ask for it … I hated the bloody thing. I never, ever thought that I would keep it on because nobody wore one and I sure as hell wasn’t going to be the guy.” That summer, CCM approached Henderson and offered him a substantial amount of money at the time if he would continue to wear the helmet the following season. Sid Abel, who was the Red Wings coach and general manager, told Henderson he didn’t want his players wearing helmets. Henderson explained that CCM was offering him money to wear it and added that his wife wanted him to wear a helmet since he had already suffered four concussions. Abel didn’t believe Henderson that CCM was going to pay him, so he showed the coach/GM the contract he was offered. “That’s the only way he believed me,” Henderson recalled with a chuckle. “So I said to him: ‘If you don’t think I’m playing well, I’ll take the helmet off.’ But I said: ‘I think if I’m playing OK, I should have the right to wear the helmet. He said: ‘OK, that’s reasonable.’ “About four games later, New York came in and we beat them 5-3 and I had four goals and an assist that night and he came up to me after the game and said: ‘Paul, I got no problem with you wearing a helmet.’ ” The “Paul Henderson helmet” was officially born. “The thing that saved me is that Mikita put one on the year before,” Henderson said. “It was that round thing — it looked like an igloo. But that’s the story. I had no intention of leaving it on until CCM came on and wanted to pay me to wear it.” Surprisingly, Henderson said other NHL players didn’t tease him about wearing a helmet. “Not one person,” he said. “I was amazed. When I went to training camp, I thought even some of my guys would have teased me. But I can’t ever remember a guy ever saying anything. I thought I would get it, for sure. But I was a pretty clean hockey player. I wasn’t a fighter or anything like that. If I was a fighter, I think it would have been a lot more difficult. “That model probably went out of circulation a long time ago, when I come to think of it,” Henderson added. “It turned out to be a good deal for CCM. I thought they were overpaying me at the time. But CCM was so good to me. When I jumped to the WHA (leaving the Toronto Maple Leafs for the Toronto Toros in 1974), they kept paying me for another two years when I was right out of sight here. It turned out good for both of us. “I still have people come up to me and tell me: ‘I wore the Paul Henderson helmet.’ Kids called it the Paul Henderson helmet.” They certainly did — and they felt fortunate if they got to wear one. Thanks to the Hockey Hall of Fame for Frank's biography: Frank Mahovlich was a talented and classy winger, a large man with the skills and hands of a pure scorer. Known as "the Big M," Mahovlich was touted as a superstar while still a teenager. He went on to have a marvelous career, patrolling the left wing for 22 professional seasons in both the NHL and WHA. Many of those years were filled with glory as he earned individual awards and the Stanley Cup, but Mahovlich struggled through most of his hockey life with the stress that comes from great expectations. Born in Schumacher, a small town in northern Ontario, he was a prodigy with the St. Michael's team that represented Toronto in the Ontario Hockey Association. When he was 17, he scored 24 goals and scouts and fans alike began to fill the arenas where he played to get a look at the big kid everybody was talking about. The next season he fired 52 goals in 49 games, won the Red Tilson Trophy as the league's most valuable player and made his first three appearances with the Leafs. Those who saw him play in junior talked about his potential to dominate, even at the professional level. In his first full season in the NHL, 1957-58, he was solid and at times spectacular and his 20 goals and 36 points were enough to earn him the Calder Trophy as top rookie. He beat out Bobby Hull, who also entered the league that year as a much talked about youngster. At 19, Mahovlich seemed on the cusp of not just a great but a record-shattering career. His next two seasons were erratic on the ice but consistent on the score sheet. He hovered around 20 goals, good totals for a young player, but many Toronto fans wanted a superstar performance each night, on every shift, and 20 goals wasn't good enough. In 1960-61, he began to play the way everyone had always expected. Still only 23 years old, he had an exceptional start to the season and led the league for much of the year in goals. With 14 games remaining, he had 48 goals, two less than Maurice Richard's record of 50. He seemed destined to seize the position of the game's top scorer. Those final two goals never came, however. Bernie Geoffrion overtook him late in the year, tying the Rocket's record in the process. People began talking not about how much talent Mahovlich had, how he'd scored 48 goals at such a young age, but what was missing in him that prevented him from achieving more. Although the Leafs won the Stanley Cup for three consecutive seasons beginning in 1962, and even though Mahovlich averaged over 30 goals a year, he was the focus of much criticism and constant boos when he played in front of the home crowd. When he failed to score a goal in the 1963 playoffs, he was booed during and after the game in which the Leafs clinched the title. Even the next day the heckling continued at a reception in downtown Toronto for the Cup winners. Mahovlich responded to Imlach's berating by not reacting to it. He admitted later that the two men didn't speak for five years. Though the team and the doctors didn't admit it for several years, Mahovlich was hospitalized in 1964, suffering from acute tension and depression. He returned to the team but struggled on the ice, his goal production dropping to 18 in 1966-67, the year of his final Cup victory with Toronto. The Leafs played the Montreal Canadiens on November 1, 1967 - an important game between long-time foes. Mahovlich played a wonderful game, scoring a goal and adding two assists in Toronto's 5-0 win. He was named one of the three stars of the game and took his bow in front of the remaining fans as was the custom at the end of the evening. Many in the crowd cheered the big winger, but there were also boos, even on that night. The next day, with the Leafs leaving on a trip to Detroit, Mahovlich got up from his seat on the train, told a teammate he was going home and left. He was soon under the care of the Toronto General Hospital psychiatric staff. He was in a deep depression and, according to many reports, had suffered a nervous breakdown. Mahovlich stayed away from the rink to deal with his nervous condition. After more than a month, during which he missed 11 games, he made his return at home in a game against the Canadiens. While he was away, young Mike Walton had taken up the slack in scoring for the Leafs, winning several consecutive games with late goals. 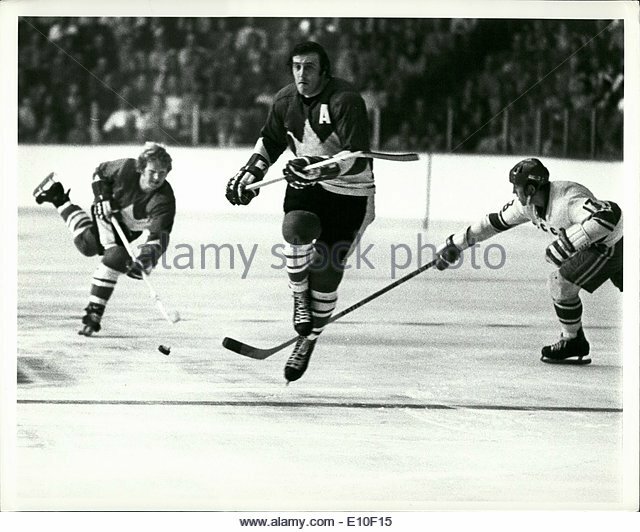 When Mahovlich stepped on the ice, he was on a line with Walton and the Leafs captain, George Armstrong. Mahovlich gathered the puck at center and sailed down the right wing into the Montreal zone, pulling a defenseman wide with him to open up the middle. With one perfectly placed pass, Mahovlich found Walton, who fired it into the net. In all it took 18 seconds for the Big M to announce his return, and now the fans were united in their applause. Near the end of the season, the Leafs decided to part ways with their big winger. In the biggest trade of the year, he was sent to the Detroit Red Wings with Pete Stemkowski, Garry Unger and the rights to another Leaf enigma, Carl Brewer, for Paul Henderson, Norm Ullman and Floyd Smith. Freed in Detroit from all the pressure and conflict in Toronto, Mahovlich experienced a rebirth. He also joined his younger brother Pete, known as "the Little M" even though he had five inches on Frank. The elder Mahovlich became more outgoing, joking with teammates and fans. He was put on a line with Gordie Howe and Alex Delvecchio and had his best goal-scoring year in his first full season with the team, 49 goals in 1968-69. In Detroit, Mahovlich played more minutes than ever on the first line on the powerplay and sometimes even killed penalties. When Howe became the third player to break the 100-point plateau in 1968-69, Mahovlich was cited as a significant factor. After several successful and happy years in Detroit, Mahovlich was on the move again, the victim of a Detroit team that was struggling and dumping high-priced players to rebuild. The Montreal Canadiens were preparing for a run to the Cup and acquired the big left winger for three players in January 1971. 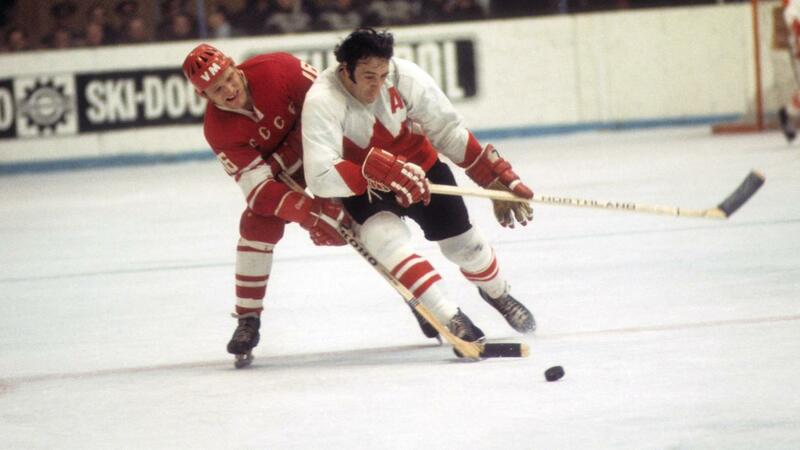 Once again, Mahovlich was teamed with his brother Pete, who had joined the Canadiens the year before. Mahovlich had a spectacular playoffs with a Montreal team that won the Stanley Cup that year due in large part to his league-leading 14 goals and 27 post-season points. Mahovlich was truly happy in Montreal. 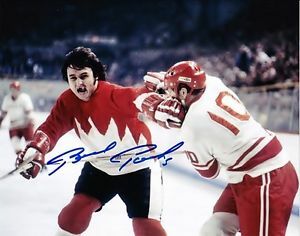 He had his best overall season in 1971-72, collecting 96 points, and earned a place on the Canadian team that battled the Russians in the 1972 Summit Series. In 1973 Mahovlich was selected to the NHL's First All-Star Team, one of only three times he achieved that honour. And once again he was outstanding in the playoffs, capturing his sixth and final Stanley Cup. Mahovlich and Montreal were a natural fit and only his aging legs and a move toward younger athletes in the Canadiens organization prevented him from continuing to put up big numbers late into his career. Instead of finishing his career in Montreal, Mahovlich signed a lucrative contract with the World Hockey Association. The Houston team selected him in the 1972 Entry Draft and then traded him to the Toronto Toros, who attempted to sign both Mahovlich brothers. They were thrilled when Frank, at age 36, signed a four-year deal. He was one of the league's top scorers and headlined the team in its attempt to compete with the Leafs. The Toros team moved after two seasons to Birmingham, deep in the southern U.S., and became the Bulls. Though Mahovlich still had a great desire to play, the Bulls didn't capture the imagination of the fans. At the end of his four-year contract, having just turned 40, Mahovlich parted ways with Birmingham, which was replacing its expensive veterans with unproven juniors in an attempt to stay afloat. Frank Mahovlich was elected to the Hockey Hall of Fame in 1981, and in 1998, in recognition of his years of class on the ice and off, he was appointed to the Canadian Senate by Prime Minister Jean Chretien. Wikipedia: Awards and achievements: Calder Memorial Trophy winner in 1958. Played in 1959, 1960, 1961, 1962, 1963, 1964, 1965, 1967, 1968, 1969, 1970, 1971, 1972, 1973, and 1974 NHL All-Star Games. Selected to the NHL First All-Star Team in 1961, 1963, and 1973. Selected to the NHL Second All-Star Team in 1962, 1964, 1965, 1966, 1969, and 1970. Stanley Cup champion in 1962, 1963, 1964, 1967, 1971 and 1973. Inducted into the Hockey Hall of Fame in 1981. Inducted into Canada's Sports Hall of Fame in 1990. In 1997, he was ranked number 26 on The Hockey News' list of the 100 Greatest Hockey Players. 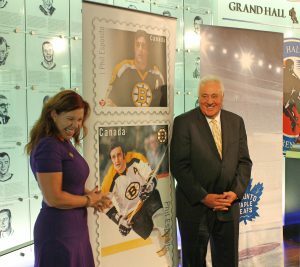 Inaugural inductee into the World Hockey Association Hall of Fame as a "Legends of the Game" in 2010 Number (27) Retired by the Toronto Maple Leafs (shared with Darryl Sittler) In January, 2017, Mahovlich was part of the first group of players to be named one of the '100 Greatest NHL Players' in history. January 11, 1986: Marcel Dionne of the Los Angeles Kings becomes the first player in NHL history to score 20 goals in each of his first 15 seasons. Dionne scores twice and has an assist in a 4-4 tie at St. Louis vs the Blues. January 13, 1971: Five days after being named general manager of the Detroit Red Wings, Ned Harkness trades left wing Frank Mahovlich to the Canadiens for forwards Mickey Redmond (photo), Bill Collins and Guy Charron. Franl helps the Canadiens win the Stanley Cup in 1971 and 1973 while Mickey becomes first 50-goal scorer in Red Wing history in 1972-73 - a feat he repeats the following year. January 13, 1979: The "Triple Crown Line" plays together for the first time in the Los Angeles Kings' 7-3 victory against the Red Wings in Detroit. Center Marcel Dionne scores four goals, including the 300th of his NHL career, playing between right wing Dave Taylor and left wing Charlie Simmer, who gets the spot two days after being recalled from the minors. Taylor scores a goal and Simmer contributes an assist. January 14, 1971: Phil Esposito scores three goals, setting a modern NHL record with his fifth hat trick of the season, in the Boston Bruins' 9-5 victory against the Los Angeles Kings at Boston Garden. Esposito also has three assists for a six-point night. It's his 10th NHL hat trick and it helps the Bruins extend their home winning streak to 12 games. Janiary 15, 1970: Bobby Orr (Team Canada 72) has two assists in the Boston Bruins' 6-3 victory against the Los Angeles Kings at Boston Garden, setting an NHL single-season record for defensemen with 51. 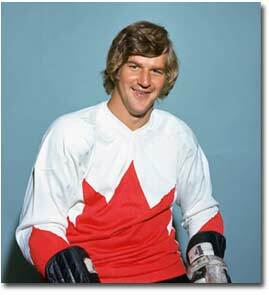 Orr passes the mark of 50 set by Pat Stapleton (Team Canada 72) of the Blackhawks in 1968-69. 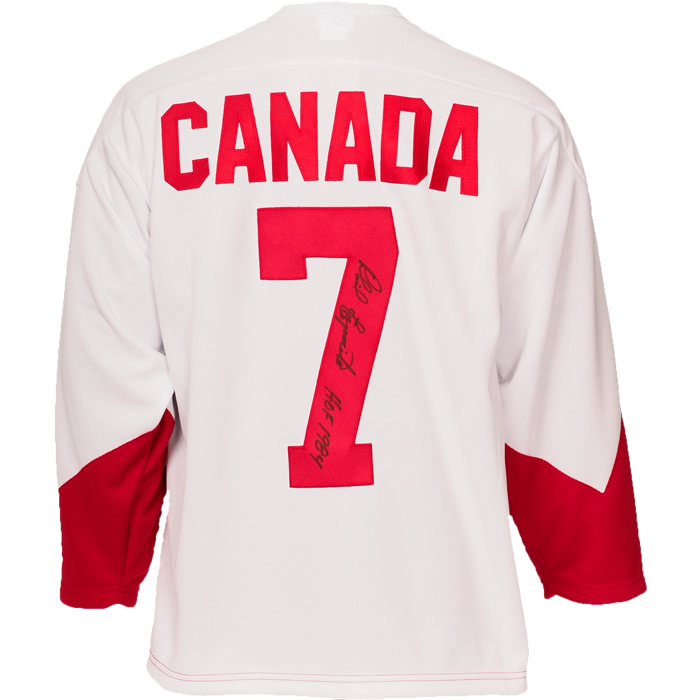 The record-setting assist comes on the first of two third-period goals by Phil Esposito (Team Canada 72). January 15, 1984: Tony Esposito (Team Canada 72) gets his final NHL victory and shutout when the Blackhawks defeat the Pittsburgh Penguins 2-0 at Chicago Stadium. The winningest goaltender in Blackhawks history makes 35 saves for his first shutout since March 27, 1983. It's the 423rd NHL win and 76th shutout for Esposito; 418 of the victories and 74 of the shutouts come with the Blackhawks, who select him from the Montreal Canadiens in the 1969 intraleague draft. January 17, 1973: At age 23, Philadelphia Flyers forward Bobby Clarke becomes the youngest captain in NHL history when he succeeds Ed Van Impe. Bobby remains captain through the 1978-79 season, then returns as captain from 1982-84. Bobby's appointment by the Flyers as team captain comes just slightly more than three months after the Summit Series concluded on September 28, 1972. Bobby clearly established himself as a leader on and off the ice for Team Canada earning the respect of his teammates and his nation. January 18, 1964: The Boston Bruins defeat the Toronto Maple Leafs 11-0 at Boston Garden for the biggest shutout win in their history. Dean Prentice scores three goals and assists on three more, and Andy Hebenton has his third NHL hat trick and an assist. Ed Johnston (Team Canada 72) gets the shutout. January 18, 1967: The NHL All-Star Game is held at midseason for the first time. The Stanley Cup champion Canadiens defeat the All-Stars 3-0 at the Forum. 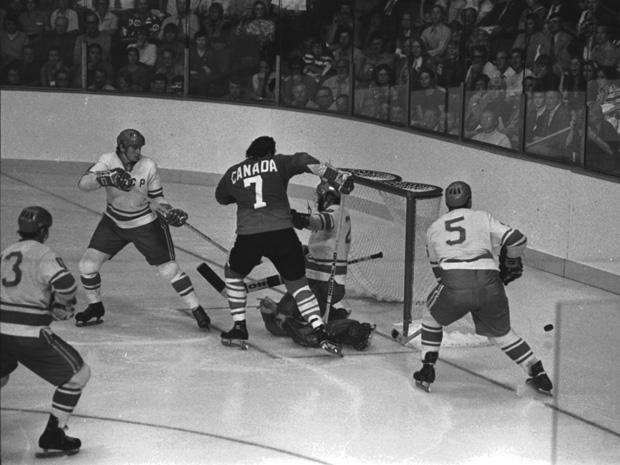 John Ferguson (Team Canada 72 coach) scores two goals and goalies Charlie Hodge and Gary Bauman combine for the shutout, still the only one in All-Star Game history. January 21, 1985: Dionne scores a first-period goal against the Edmonton Oilers. It's the 611th of his NHL career, moving him past Bobby Hull into third place on the all-time list. 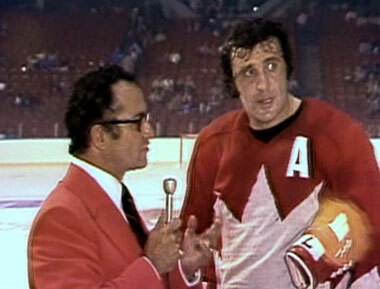 January 25th is a very special day for Team Canada 72's inspirational leader Phil Esposito. On January 25, 1964: as a rookie centre for the Chicago Blackhawks Phil scored his first very NHL goal of his storied career. He beat Detroit Red Wings goalie and future Hall of Famer Terry Sawchuk at 16:01 of the second period during a 5-3 loss at Olympia Stadium. 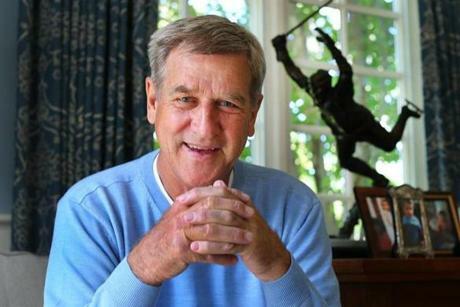 Exactly 8 years later on January 25, 1972 Phil's Boston Bruin teammate defenseman Bobby Orr set Phil up for the winning goal early in the third period to lift the East Division All-Stars to a 3-2 victory against the West Division at the NHL All-Star Game in Bloomington, Minnesota. Bobby earned the MVP award after the East rallies for the win. Injuries are a part of life, and most certainly a part of sports. There is no doubt that if Buffalo Sabres fabled sniper Rick Martin had not sustained a career-ending injury he would have been inducted into the Hockey Hall of Fame long ago. Martin would likely have played at least five more years in the NHL. He also would have easily attained the shoo-in induction numbers of 500 goals and 1,000 points. Martin was a Paul Bunyan-esque player, at least in terms of his explosive shot. There are tales in Buffalo of Bernie Parent’s eyes growing as big as saucers at the sight of a Martin slap shot. 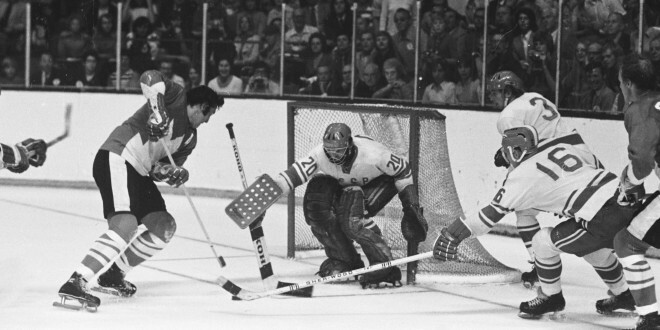 Gilles Meloche suffered cracked ribs after stopping one. There was even talk of a Martin howitzer beating a goalie and ripping out the back of the net so fast that it was missed by everyone including the goal judge. These aren’t tall tales, Martin was a legendary player when he played and was nearly unstoppable. But injuries do happen and Martin sustained a devastating one during a November 8, 1980 game against the Washington Capitals. A collision with Caps’ goalie Mike Palmateer, in which Palmateer kicked Martin’s knee, caused the leftwinger to suffer severe cartilage damage. The injury all but ended Martin’s career, and led to a lawsuit in which then Sabres’ coach Scotty Bowman and the team’s physician were both named. His injury is the reason why Martin is not yet in the Hockey Hall of Fame, but it is the only one. On the contrary, there are numerous reasons for his induction that we shall discuss, and possibly right a wrong by garnering enough attention. Rick Martin – A Remarkable Rookie Season The Sabres made Rick Martin the fifth overall selection in the 1971 draft. Guy Lafleur, Marcel Dionne, Jocelyn Guevremont, and Gene Carr were the only players chosen ahead of him. Obviously, Martin forged a greater career than at least two of those players. In his rookie 1971-72 season, Martin was better than a point per game player. With 74 points in 73 games, he tied with eventual “French Connection” linemate Gilbert Perreault for most points on the team though Martin achieved it in three less games. The year prior, the sleek center, Perreault, had set the NHL record for goals in a season by a rookie with 38. Martin broke that record when he notched 44 tallies. More importantly, Martin quickly established himself as one of the premier goal scorers in the NHL in only his first year. Those 44 markers placed him sixth in the league, beating out established scorers such as Hall of Famers Frank Mahovlich, Johnny Bucyk, Stan Mikita and Rod Gilbert as well as other proven vets like Mickey Redmond, Dennis Hull and Bill Goldsworthy. Martin finished second to Canadiens star goaltender Ken Dryden in Calder Trophy voting as the league’s top rookie. In retrospect, the argument could have been made that the 1971-72 Calder should have been Martin’s. While Dryden was still technically a rookie in regards to games played, he had already showcased his immense talent the year prior when he backstopped Montreal to a Stanley Cup title. A Scoring Machine With “The French Connection” In March of Martin’s rookie season, the Sabres traded colorful veteran Eddie Shack to the Pittsburgh Penguins in exchange for right winger Rene Robert. With the trade, the Sabres had assembled the pieces of what would be the most dominant forward line of the 1970s. Although we won’t focus on the trio but will specifically stick to discussing Martin and his accomplishments, it should be noted that “The French Connection” have all had their jerseys retired by the Sabres, and hockey fans are well aware of their dominance. Martin’s performance individually may oftentimes be overlooked due to the trio’s success as a unit. Martin became the premier left winger throughout much of the 1970s. 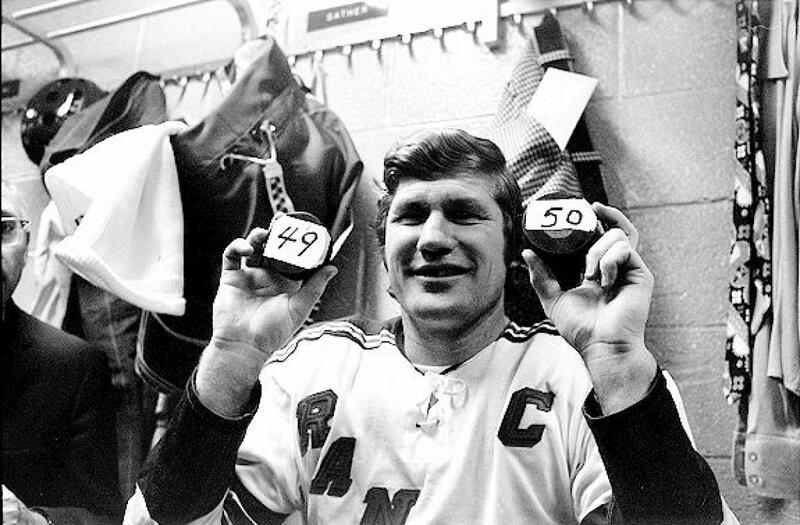 Five times between 1971 and 1980 Martin surpassed the 40-goal mark. Within that span, he found the back of the net 375 times in the regular season. He nearly had three straight seasons of 50 goals: 52 in 1973-74 and 1974-75 and 49 goals in 1975-76. He still has the Sabres’ record for most hat tricks in a career with 21, ranked third all-time among left-wingers of the modern era. Because of his immense production, Martin was named a First Team All-Star in 1974 and 1975. Then, a Second Team All-Star in 1976 and 1977. He also played in seven straight All-Star Games from 1972 to 1978. No left winger was more dominant. Don’t believe it? Comparing Martin to Other Left Wingers - Martin scored 384 career goals, but we will focus on the 375 from 1971 to 1980, mainly because this total came before his injury. Once Martin sustained the knee injury, his production was still there (more on that shortly) but he couldn’t play regularly. Two of Martin’s contemporaries on the left side who have received Hall of Fame induction are former Philadelphia Flyers great Bill Barber and Canadiens great Steve Shutt. Both Barber and Shutt are often thought of as the best players at their position during their careers, and overshadow Martin in most discussions but they weren’t more productive. While Martin’s rookie season was in 1971-72, Barber and Shutt first played in 1972-73. To be fair, we will look at their production through 1980-81 in order to give the same time frame for comparison. Looking at those years, Barber scored 326 goals—49 less than Martin – and had one 50-goal season as opposed to Martin’s two. Shutt scored exactly the same number of goals as Barber in that span—326. While Shutt had a 60-goal season, it was the only time that he would score above 50 in a year. It is shocking to see it spelled out that way. Martin’s Astounding Goals per Game - The most telling number of Martin’s career is the rate at which he scored per game. He scored 384 times in only 685 games. It is astounding that Martin’s 0.561 goals scored per game is the eleventh highest in NHL history. His rate of goal production is better than each of these Hall of Famers: Phil Esposito, Maurice Richard, Marcel Dionne, Cam Neely, Pat LaFontaine, Guy Lafleur, Howie Morenz, Mike Gartner, Teemu Selanne… need we go on? Martin left the game with such a high number intact because he still managed to produce after his injury. Bowman traded him to the Los Angeles Kings on March 10, 1981, in exchange for draft picks. Still nagged by a knee that regularly filled with fluid, Martin still played four games with the Kings and in those four games, he scored two goals and four assists. A Posthumous Induction for Martin - Martin did not win a Stanley Cup. Some would argue that is why Barber and Shutt are in the Hall, but he is not. He came close in 1975 as Buffalo lost in the Finals to the Flyers. He tied with Perreault in playoff scoring during the Sabres’ Cup run, each with 15 points in 17 games and he was the Sabres’ leading scorer in the Final. In six games against Bernie Parent and the Flyers, he had two goals and four assists. While there is no Stanley Cup championship to his name, Martin should be in the Hall of Fame from his play alone. His production, the regularity at which he did it, and the depth of his numbers still stand. He belongs. Sadly, if and when Rick Martin is inducted into the Hockey Hall of Fame, it will be done posthumously. Martin passed away in March 2011 from a heart attack while he was driving. It would have been a great tribute for him to have witnessed and taken part in his own induction. However, it would be most meaningful now for his family to see an honor bestowed upon him just the same. One he should have received long ago. One of the most storied teams in Belleville's rich hockey history took centre stage at CAA Arena Friday evening. 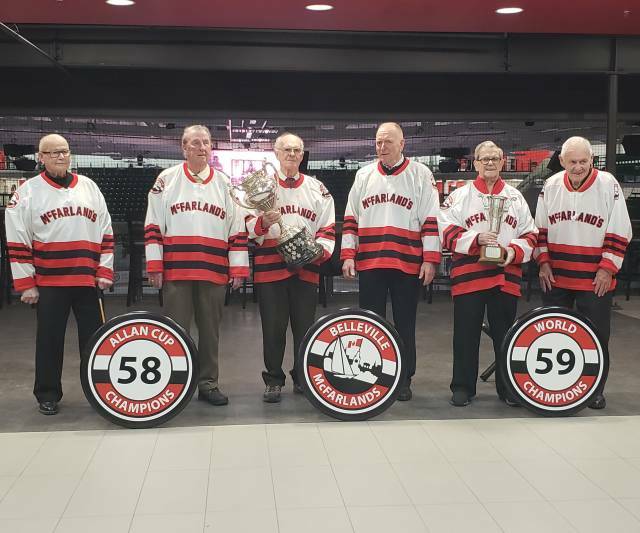 The Belleville McFarlands were honoured for the 60th anniversary of their 1959 World Championship victory on the second annual History of Hockey Weekend prior to the Belleville Senators game versus the Toronto Marlies. As part of the event, the Senators rebranded their current fan zone as a nostalgic nod to the team that took the city - and the country - by storm six decades ago. Included in the update was the opening of McFarland's Pub, a display of memorabilia from the Hockey Hall of Fame, and a silent jersey auction and raffle for fans. Seven former McFarland's made the return to Belleville, with the majority of them having played on the 1958 Allan Cup Senior Championship team. 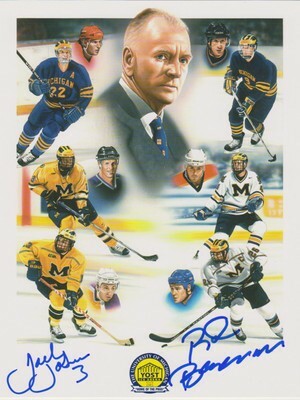 One of those ex-McFarland's, Red Berenson, was a 19-year old star at the University of Michigan in 1959 and wound up going on to play nearly 1,000 games in the NHL with the Montreal Canadiens, St. Louis Blues, New York Rangers and Detroit Red Wings. He says his time with the McFarland's was one of his big career highlights and that it was nice to see some old friends and share some stories. "“It was a great event when it happened, when we all played together in 1959, when we won the World Championship. I haven’t seen some of these guys since then, because I went back to college. I was the youngest player on the team and was on a different path. It’s great to see some of them and some of them are still doing pretty well and looking pretty good." The team was backed by strong goaltending from Gordie Bell, and stellar defence from the likes of Jean-Paul Lamirande, Al Dewsbury and Belleville's own Floyd Crawford, who captained the team. Up front, the likes of Berenson, Belleville natives Wayne "Weiner" Brown and Lionel Botly, Prince Edward County's Keith MacDonald, player-coach Ike Hildebrand, Pete Conacher and others were the men who dazzled with their speed, finesse and scoring ability. "I was in awe of how good these guys were and they were playing senior hockey," Berenson said. "They had the camaraderie and the confidence, because they already won the Allan Cup, they knew how to win and they were a great big family. They loved each other and they played hard for each other. It was a great experience for me as a young player." The native of Regina, Saskatchewan added it’s important for young hockey fans to understand just how much a team like this means to a small-town-type city like Belleville and events like this certainly help develop that understanding. "I remember when I was a kid and they would celebrate former junior players or pro players and I looked up to all of them. I thought it was magical to be able to meet them and get their autograph. You can see a little bit of that here." 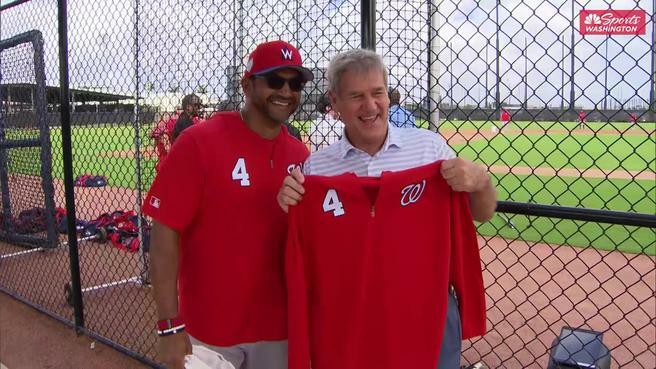 Chief Operating Officer of the Senators Rob Mullowney says the special part about the weekend was to reunite long-time teammates and rekindle fond memories. "It's really a privledge for us to host them and pay tribute. That's something I think we'll never see happen again, a local senior hockey team winning a world championship. It's a tremendous part of the rich history of this community and we're really proud to tell that story." Those memories from the late 1950s were plentiful from all players and their families, but one that stuck out for Wayne "Weiner" Brown was proudly wearing the maple leaf on his chest for Canada at the World Championships in the former Czechoslovakia. "When we were in Prague, and you put the Canadian flag on and you're behind the iron curtain, it makes you a hero," an emotional Brown said. For Berenson, beating the former Soviet Union, who had been the pre-tournament favourite due to their vast depth of professional-type players, was a highlight that stood out. "When we played the Russians, there were no Russians in the NHL then. The best Russians were playing on that team. We beat them 3-1." The Senators wore McFarland’s-inspired uniforms for Friday night’s game against the Marlies and will also don them for Saturday’s contest. Following Saturday's game, the jerseys will be auctioned off and Mullowney said the proceeds will go back to minor hockey in the area. The players who were able to return were honoured on the ice in a pre-game ceremony as well and dropped the puck prior to Friday's game. A documentary of the McFarland's championship success was also played before the game on the big screen inside CAA Arena. Thanks to the Hockey Hall of Fame for Paul's biography - A skilled right-winger, Paul Henderson used his speed and a willingness to gamble on offense to great effect during his pro tenure. He scored at least 20 goals seven times in the NHL and was a top performer in the World Hockey Association. 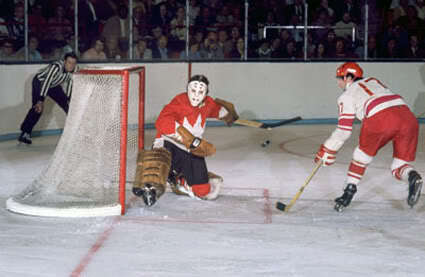 Despite an exemplary career as a professional, Henderson carved his permanent place in hockey history with his scoring heroics for Team Canada in the 1972 Summit Series versus the Soviets. Born in Kincardine, Ontario, Henderson was signed as a teenager by the Detroit Red Wings' organization. He was a standout with the parent club's top junior affiliate, the Hamilton Red Wings, where he scored an OHA best of 49 goals in 48 games during the 1962-63 season. That impressive year also featured a two-game call-up to the Wings. The next year he split his playing time between the Motor City and the Pittsburgh Hornets of the American Hockey League. Henderson developed into a consistent, full-time NHL winger in 1964-65, playing on a line with Pit Martin and Larry Jeffrey. The following season he recorded his first 20-goal season and helped Detroit reach the Stanley Cup final, where they succumbed to the Montreal Canadiens in six games. Henderson lost 24 games to injury in 1966-67 but still managed to score 21 goals. Late in the 1967-68 season, Henderson was involved in a multi-player deal that brought him to the defending Stanley Cup-champion Toronto Maple Leafs. Norm Ullman was the key player joining Henderson in Hogtown while the Wings' prize catch was Frank Mahovlich. 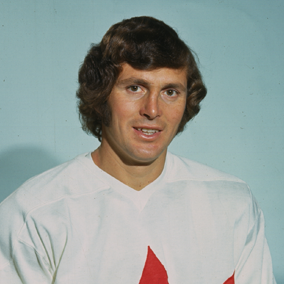 Henderson scored a personal best of 27 goals during his first full year in Toronto in 1968-69. He formed an effective partnership with former Red Wings teammate Norm Ullman and emerging star Ron Ellis. Between this season and 1971-72, the Ullman-Henderson-Ellis line established a host of Maple Leafs single-season scoring records for a forward line. In 1970-71 Henderson scored a career high of 60 points then registered a personal best of 38 goals the following season. What was lacking from this period of individual success for Henderson was any sort of post-season achievement by Toronto. After being in 33 playoff games in three seasons from 1963-64 to 1965-66 with Detroit, Henderson took part in only 19 post-season matches in seven seasons with the Maple Leafs. The triumph that stands out in Henderson's career is from the early 1970s. 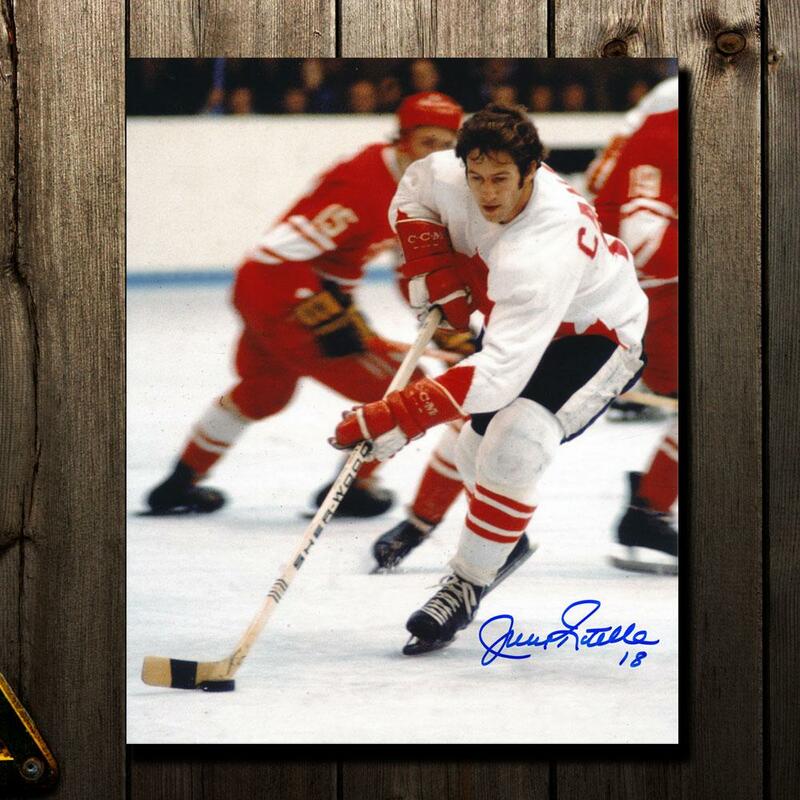 Coming off his 38-goal performance in 1971-72, the speedy winger was deemed a potential asset on the Canadian squad being that was assembled for the upcoming Summit Series against the Soviets. Team Canada coaches Harry Sinden and John Ferguson believed that Henderson would add depth and stability to their squad. Nobody on either team could have anticipated what would transpire during the series. During Canada's disappointing 1-2-1 showing in the first four games of that series in Montreal, Toronto, Winnipeg and Vancouver, Henderson performed admirably on what was essentially a checking line. 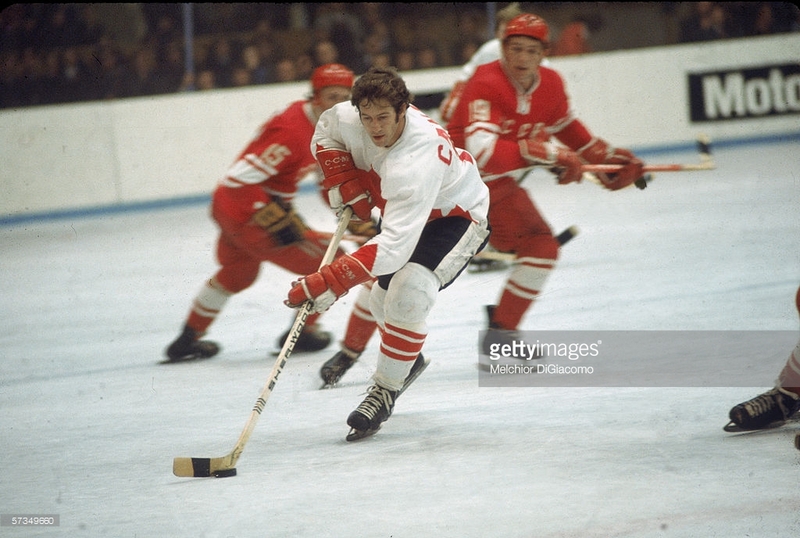 He and linemates Ron Ellis and Bobby Clarke were the most cohesive unit from the first day of training camp and they were arguably three of the most consistent players among the Canadian contingent in the first half of the series. After a heartbreaking loss in the first game in Moscow, game five of eight, Canada stormed back to win the last three games, each by a goal. Remarkably, Henderson scored the winner in each of these one-goal decisions. The most spectacular was the winner with two minutes to go in game seven, which gave Canada a 4-3 win. Late in the eighth game, with the score tied 5-5, Henderson called for Pete Mahovlich to come off the ice. He immediately headed for the net and narrowly missed his first chance before jumping on the rebound of a Phil Esposito shot. 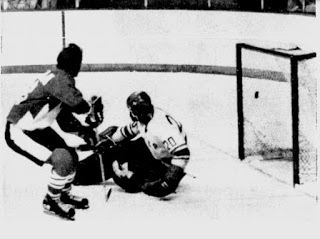 Henderson took two swipes at the puck before slipping the series-winner past Vladislav Tretiak with 34 seconds left in the game. This historic moment earned Henderson a special place in Canadian history. Nearly every Canadian who is old enough is able to recall where they were when "the goal" was scored. Exhausted and distracted 1972-73, Henderson managed to play only 40 games for Toronto. The team was seriously weakened by defections to the World Hockey Association and finished well back of playoff contention. Improvements came the following season and Henderson scored 24 goals in 69 games. During this period, Maple Leafs owner Harold Ballard feuded with many of his players. 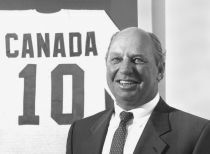 After experiencing the euphoria of the Summit Series, Henderson felt the environment around the Toronto team seemed stale. This contributed to the famous winger's yearning for a change of scenery. 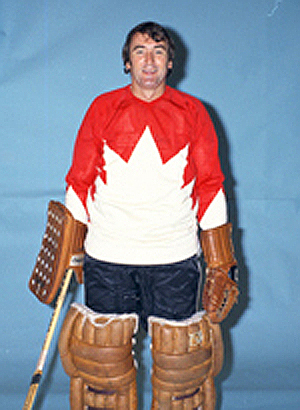 Henderson stayed in Toronto but joined the Toros franchise of the World Hockey Association prior to the 1974-75 season. 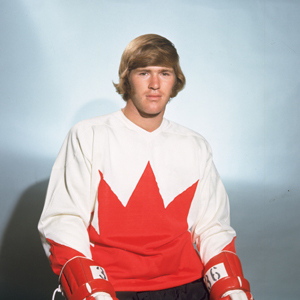 Before suiting up for his new club, he took part in the 1974 Summit Series, which matched most of the Soviets from the previous series against a Team Canada squad made up of the top stars from the WHA. Skating with the likes of Gordie Howe, Bobby Hull and '72 series-veteran Frank Mahovlich, Henderson was expected to come up with some pretty good offense and leadership. 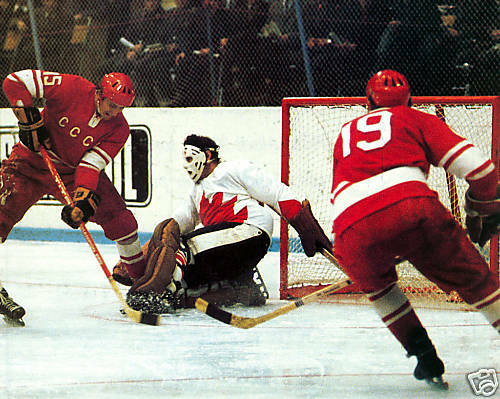 He played well but the Soviets were out for revenge and posted a 4-1-3 series win. In five seasons with the Toronto Toros/Birmingham Bulls franchise, Henderson scored 140 goals but took part in only five playoff games. On September 17, 1979, he was signed by the Atlanta Flames and split the season between that NHL team and the Birmingham Bulls of the Central Hockey League. Henderson scored his last 13 NHL points in Dixie before retiring from the league. One night in March, he gained a measure of revenge against Ballard by scoring two goals in a 5-1 Atlanta win at Maple Leaf Gardens, which earned him selection as the game's first star. Henderson played his last pro season in 1980-81 and then retired. His NHL total is 236 goals, but it was his unforgettable moments on the ice at the Luzhniki Arena in Moscow that ensured his immortality in hockey history. 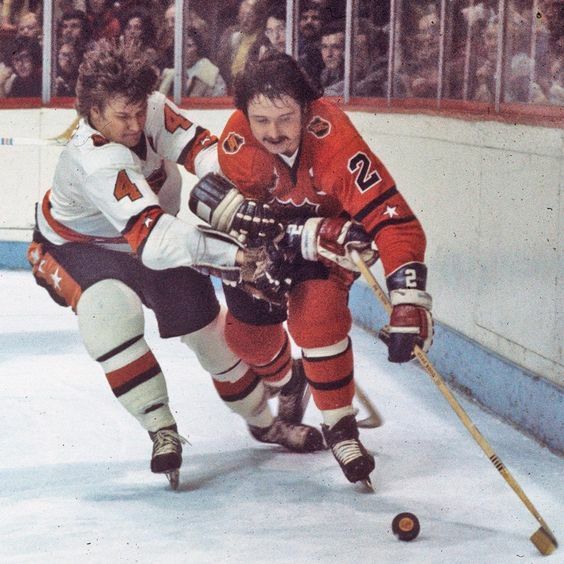 February 2, 1974: Bobby Clarke has six points, including his second NHL hat trick, Ross Lonsberry scores three goals and Simon Nolet has a goal and four assists in the Philadelphia Flyers' 12-2 win against Detroit at the Spectrum. It's the first double hat trick in Flyers' history. February 2, 1980: Phil Esposito of the New York Rangers becomes the second player in NHL history to score 700 goals when he gets Nos. 699 and 700 in a 6-3 victory against the Washington Capitals in Landover, Maryland. He scores No. 699 in the second period, then joins Gordie Howe in the NHL's 700-goal club early in the third period by taking a pass from Don Maloney and beating Wayne Stephenson with a wrist shot. 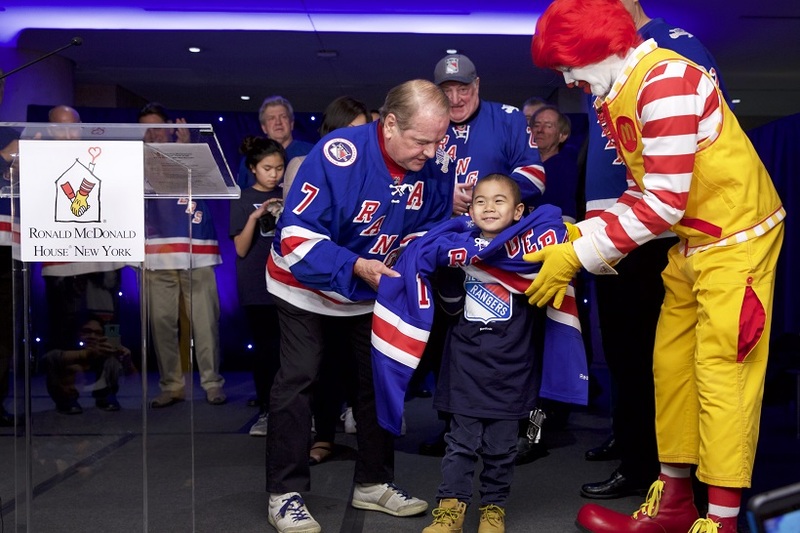 Ronald McDonald House New York has selected New York Ranger Hockey Club veteran player and Hall of Famer Rod Gilbert to be honoured with the Child's Champion Award at the Friday, February 22, 2019 25th Annual Skate With the Greats at the Rink at Rockefeller Center. The recognition is bestowed upon Rod Gilbert in honour of his 25th year participating in this signature event raising awareness and millions of dollars for children with cancer. All ticket holders will have the opportunity to meet, greet and skate with many of your favourite New York Ranger Alumni Greats for autographs and photograph opportunities. It is truly an event for both your business associates as well as the whole family especially any hockey fan young or old. Please join with Rod Gilbert in support of helping the children and their families at Ronald McDonald House New York. For Skate With The Greats special Silver Anniversary memorabilia, event tickets or financial support www.rmh.newyork.org/events/skate. Ronald McDonald House New York provides a temporary home for paediatric cancer patients and their families in a strong, supportive and caring environment which encourages and nurtures the development of child-to-child and parent-to-parent support systems. February 6, 1971: Phil Esposito scores a goal and assists on two others in the Bruins' 4-3 win against the Buffalo Sabres at Boston Garden. The three-point night gives Espo back-to-back 100-point seasons. February 11, 1968: The New York Rangers rally for a 3-3 tie with Detroit in the final game played at the old Madison Square Garden. Rod Gilbert has three assists for New York, including one on Jean Ratelle's game-tying goal in the third period that turns out to be the last in the old Garden. The Rangers play their first game in the new (and current) Garden one week later. February 13, 1975: Bobby Orr has an assist for the Boston Bruins in a 3-1 road loss to the Buffalo Sabres to become the first player in NHL history to reach 100 points in six consecutive seasons. It's the final 100-point season of his NHL career. 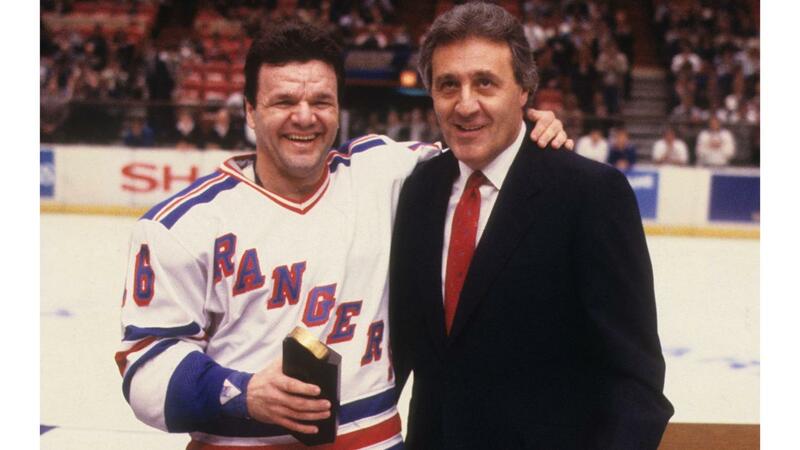 February 14, 1988: Marcel Dionne passes Phil Esposito to move into second place on the NHL all-time goal-scoring list when he scores two power-play goals for the New York Rangers in a 4-4 tie with the New York Islanders at Madison Square Garden. Dionne's two goals give him 719 for his NHL career, two more than Esposito. February 16, 1980: Jean Ratelle of the Boston Bruins has an assist in a 5-3 win against the Colorado Rockies in Denver to move past Beliveau into seventh place on the NHL's all-time scoring list. The assist gives him 1,220 points. Ratelle finishes his NHL career in 1981 with 1,267 and is inducted into the Hockey Hall of Fame five years later. February 17, 1979: Montreal's Ken Dryden earns his 46th and final NHL shutout when the Canadiens defeat the Washington Capitals 2-0 at the Forum. The win gives Dryden a record of 22-1-4 in his past 27 games. February 18, 1970: Bobby Orr scores his record-setting 22nd goal of the season, beating Wayne Rutledge during the Boston Bruins' 5-5 tie with the Kings at the Forum in Inglewood, California. Orr breaks his own NHL single-season mark for goals by a defenseman, set the previous season. He finishes with 33 goals. February 19, 1977: Rod Gilbert scores a goal and has an assist to become the 11th player in NHL history and the first member of the Rangers to earn 1,000 points. He reaches the milestone in his 1,027th NHL game, a 5-2 loss to the New York Islanders at Nassau Coliseum. February 22, 1983: Marcel Dionne of the Los Angeles Kings becomes the NHL's first nine-time 40-goal scorer. His 40th goal of the season comes 8:03 into the third period of a 5-3 win against the Boston Bruins at the Forum in Inglewood, California. 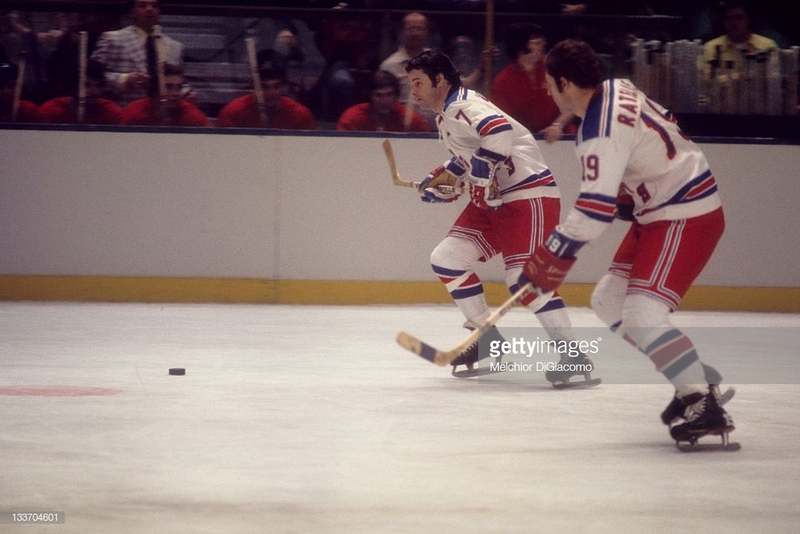 February 20, 1972 – Jean Ratelle became the first player in Rangers history to tally 100 points in a season, accomplishing the feat as the Blueshirts defeated the Detroit Red Wings, 4-3, at MSG. February 24, 1968: Rod Gilbert of the Rangers sets an NHL record with 16 shots and scores on four of them in a 6-1 victory against the Montreal Canadiens at the Forum. It is the fourth NHL hat trick for Gilbert, a Montreal native. February 27, 1977: Stan Mikita becomes the eighth player in NHL history to score 500 goals. Mikita joins the 500-goal club when he lifts a backhand shot over Cesare Maniago with 6:04 remaining in the third period of the Chicago Blackhawks' 4-3 loss to the Vancouver Canucks at Chicago Stadium. February 28, 1974: Boston Bruins defenseman Bobby Orr is credited with the 499th and 500th assists of his NHL career in his 522nd game, an 8-1 victory against the Detroit Red Wings at Boston Garden. Ross Brooks, Boston's 36-year-old rookie goaltender, ties an NHL record with his 14th consecutive victory. 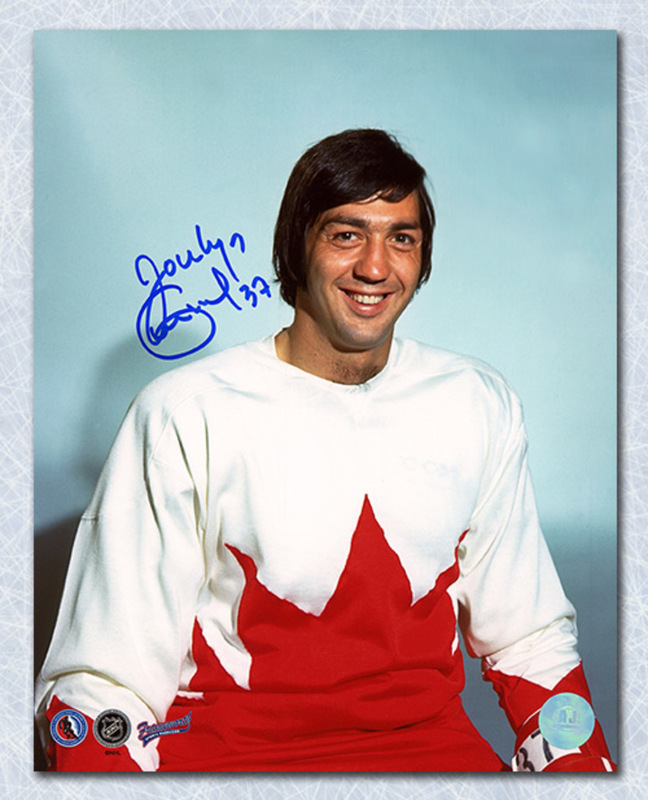 As a junior rearguard with the Montreal Junior Canadiens from 1968 to 1971, Jocelyn Guevremont established some very impressive credentials, especially for his offensive work from the point. The newly-formed Vancouver Canucks made the young rearguard their first-ever amateur selection in the 1971 Amateur Draft. And although he lacked defensive skills during the early going, he applied himself steadfastly to balance his game. As such, he finished his rookie campaign with a league-record 51 points, the most, up to that time, scored by a rookie. As an offensive specialist, Guevremont continued his industrious efforts to shore up his defensive game. The results came to fruition after his trade to the Buffalo Sabres in 1974. There he succeeded in maintaining his offensive output while landing on the positive side of the plus/minus scale year in and year out. He lasted with the Sabres until 1979. At that time, he was dispatched to the New York Rangers. In the Big Apple, however, Guevremont saw only limited action, spending much of his time in the press box watching new recruits make rookie mistakes. He was finally sent down to the New Haven Nighthawks of the AHL. But before he left, he warned the Rangers' management that unless he got some ice-time on his next invite the NHL, they could consider him to have a chronic shoulder ailment. As a result, word traveled across the league that the veteran defender was damaged goods. The fallout came in the form of no offers from other NHL clubs, such as the St. Louis Blues, who would have otherwise picked him up. Tired of waiting by the phone, Guevremont retired at the close of the 1979-80 campaign. March 2, 1969: Phil Esposito becomes the first player in NHL history to have 100 points in a season when he scores two third-period goals in the Boston Bruins' 4-0 victory against the Penguins at Boston Garden. The milestone comes one night after he breaks the single-season points record of 97 held by Stan Mikita of the Blackhawks. March 3, 1968: In one of the biggest trades in NHL history, the Toronto Maple Leafs send forwards Frank Mahovlich, Pete Stemkowski and Garry Unger to the Red Wings. Norm Ullman, Floyd Smith and Paul Henderson go to Toronto. March 5, 969: Phil Esposito assists on each of the Boston Bruins' goals in a 2-2 tie with the Detroit Red Wings at Boston Garden. The assists are Esposito's 62nd and 63rd of the season, setting an NHL single-season record. March 5, 1972: Brad Park becomes the third defenseman in NHL history to score 20 goals in a season when he beats Dunc Wilson in the third period of the Rangers' 6-1 victory against the Vancouver Canucks at Madison Square Garden. Park joins Flash Hollett (1943-44) and Bobby Orr, who does in it 1971-72 for the fourth of seven consecutive seasons. 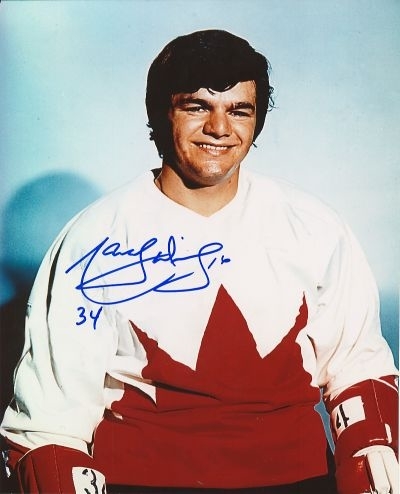 March 5, 1977: Marcel Dionne scores a goal in the Los Angeles Kings' 3-3 tie against the Pittsburgh Penguins at the Forum in Inglewood, California, to become the first player in Kings history to have 100 points in a season. Dionne, a 121-point scorer with the Detroit Red Wings in 1974-75, also becomes the first player in NHL history to score 100 points with two different teams. ON THIS DAY - MARCEL DIONNE BECOMES FIRST PLAYER TO HAVE EIGHT 100-POINT SEASONS. 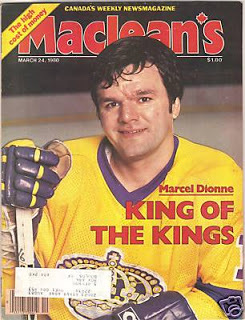 March 5, 1985: Marcel Dionne has an assist in the Kings' 6-0 victory against the Penguins to become the first player in NHL history to score 100 points in a season eight times in his career. March 6,1971: The Boston Bruins defeat the Pittsburgh Penguins 6-3 at the Civic Arena to set an NHL record for most wins in a season. It's their 47th victory, one more than the mark of 46 set by the Montreal Canadiens in 1968-69.Phil Esposito scores three goals and sets a modern NHL record with his sixth hat trick of the season. March 8, 1977: Bobby Orr announces he will not be able to play for the remainder of the 1976-77 season because of knee problems. But Orr, in his first season with Chicago, also says he's not contemplating retirement. He finishes with 23 points (four goals, 19 assists) in his first season with the Blackhawks. 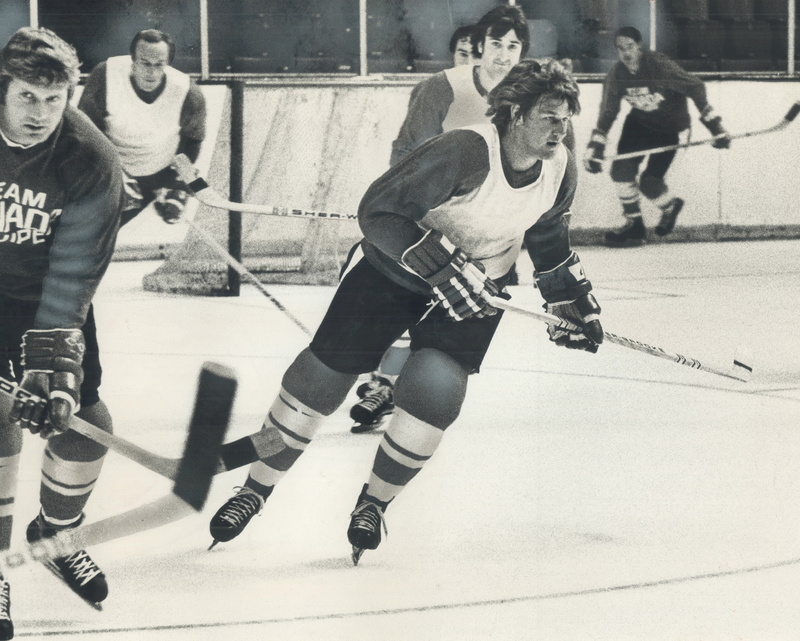 After sitting out 1977-78, Orr returns to play six games in 1978-79 before retiring. March 9, 975: Bobby Orr of the Bruins sets the NHL single-season record for goals by a defenseman when he scores his 38th in a 5-2 win against the visiting Atlanta Flames. He breaks his own mark, set in 1970-71. Orr finishes the season with 46 goals. He also has three assists and becomes the first defenseman in League history to reach 600 in his career. March 11, 1971: Phil Esposito of the Boston Bruins scores twice in a 7-2 victory against the Los Angeles Kings at the Forum in Inglewood, California, to become the NHL's all-time single-season leader in goals. Esposito breaks Bobby Hull's single-season record of 58 when he scores No. 59, beating Denis DeJordy at 7:03 of the first period. He becomes the first NHL player to score 60 goals in a season when he beats DeJordy again at 15:40 of the second period. Teammate Johnny Bucyk surpasses another Hull record by scoring two goals, giving him 99 points and surpassing Hull's single-season mark for left wings. The Bruins also become the first NHL team to win 50 games in one season. March 12, 1974: Bobby Orr becomes the first player to score 100 points for five straight seasons when he has an assist in the Boston Bruins' 4-0 win against the Buffalo Sabres at Boston Garden. Gilles Gilbert gets his seventh NHL shutout. March 14, 1971: Future Hockey Hall of Famer Ken Dryden, a late-season call-up from the minors, makes his NHL debut with the Canadiens in a 5-1 victory against the Penguins at the Pittsburgh Civic Arena. Dryden finishes with 35 saves, allowing only a goal by John Stewart. March 15, 1970: Bobby Orr of the Boston Bruins becomes the first defenseman in NHL history to have 100 points in a season. He reaches the milestone by scoring two goals and assisting on two more in a 5-5 tie with the Detroit Red Wings at Boston Garden. Orr enters the game with 97 points, then scores a goal and has an assist in the first period. Point No. 100 comes when he scores a shorthanded goal on an end-to-end rush 27 seconds into the second period, and he assists on a third-period power-play goal by Phil Esposito. Orr is the fourth player in League history to have 100 points in a season, joining Esposito, Bobby Hull and Gordie Howe; he's the first to have 100 points and 100 penalty minutes in the same season. Orr finishes the season with 120 points, becoming the first defenseman in NHL history to win the scoring title. March 15, 1979: Phil Esposito, now with the Rangers, scores four goals in New York's 7-4 victory against the Bruins at Boston Garden. It's the 31st hat trick of Esposito's NHL career. Guy Lapointe set new standards for NHL defensemen during his 16-year NHL career. Although he played for the St. Louis Blues and the Boston Bruins, he spent most of his time in the league with the Montreal Canadiens, and it was with the Habs that he established himself as a member of the team's "Big Three" defensive specialists. Along with Larry Robinson and Serge Savard, he played a major role in the Canadiens' winning the Stanley Cups six times during his time with the team. He played his junior hockey with Maisonneuve, Verdun and the Montreal Junior Canadiens. He then became a professional in 1968-69, signing on as player with the Houston Apollos of the Central Hockey League before moving on to the Montreal Voyageurs of the AHL the following year. He joined the Canadiens in 1970-71, and although Habs management loved his obvious potential, they were a little unsure of his steadiness in the pro game. But Lapointe overcame this youthful inconsistency and quickly established himself as one of the game's all-time great defensemen. He was a solid checker and opposing goalies feared his slapshot, which was particularly effective on the Habs' lethal powerplay. Being a solid two-way player was something he worked hard on throughout his career. 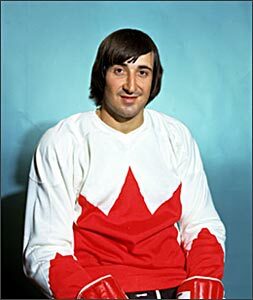 Near the start of his NHL career, Lapointe was chosen to play in the historic 1972 Summit Series against the USSR. 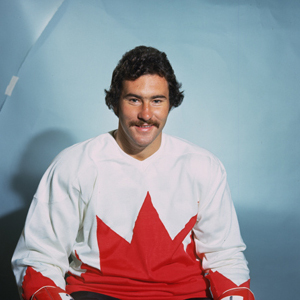 He also competed internationally for Canada in the 1976 Canada Cup and the 1979 Challenge Cup against the Soviets, which replaced that year's All-Star Game. In 1982 Montreal traded Lapointe to St. Louis. He had been unhappy because of dwindling ice time with the Canadiens but realized that the Habs had a group of up-and-coming defensemen. "I think Montreal traded me not because Guy Lapointe asked for it, but for the good of the team," he said. "We've got six good defensemen who can do the job and one more in the minors. So I think it is a good time for me to leave. And I think that Montreal is going to have good memories of Guy Lapointe because I was playing good hockey. It's better to leave now than wait until I'm in my decline and people start to boo me," he said, in reference to the Montreal fans' treatment of his co-defensive stalwart Serge Savard in his final, lesser years with the team. Lapointe had also suffered a serious eye injury that many observers felt had slowed him down. In his first year with the Blues, Lapointe broke his cheekbone and played only 50 games. The next season he signed with Boston as the Bruins tried to replace their star defenseman, Brad Park. For his part, Lapointe was anxious to show fans that the eye and face injuries of previous years wouldn't slow him down. Lapointe went on to become general manager of the Longueuil Chevaliers of the Quebec Major Junior Hockey League, then an assistant coach with the Quebec Nordiques and later a scout with the Calgary Flames. When the Minnesota Wild joined the NHL, Lapointe was hired as the franchise's Chief Amateur Scout. Guy Lapointe was inducted into the Hockey Hall of Fame in 1993. In 2014, his number 5 was retired by the Montreal Canadiens, an honour he shares with Bernie Geoffrion. Truly special athletes, the ones that fathers talk about to their sons and daughters, change the game they play. Arguments emerged late in the 20th century about who most deserved to be called the greatest hockey player of all time. Perhaps it was the retirement of Wayne Gretzky in 1999, surely a contender as hockey player of the century, or perhaps it was a desire to sum up 100 years of a sport that had come into its own and grown exponentially around the world that led to these discussions. Hockey fans in Parry Sound, Ontario, in the late 1950s saw a lot of this hockey genius in its infancy. Doug Orr, Bobby's dad, had been a speedy player and gifted scorer in his own right. He wanted his son, still small for his age but also enormously talented, to play forward in order to take advantage of his speed and puckhandling abilities. Bucko McDonald, a former NHLer who played defense in the 1930s and 1940s and coached Bobby when the youngster was 11 and 12, believed his charge had all the makings of an outstanding defenseman. He taught Bobby the ins and outs of the position and encouraged him to use his offensive skills as well. Professional teams agreed. The Boston Bruins went to unusual lengths to land the small prospect. When Orr was 14, Boston made arrangements for him to play with the Oshawa Generals in the metro Junior A League. He continued to live at home and commute to each game. Though he didn't attend a single practice with the team, Orr was selected to the league's Second All-Star Team. All the speedy youngster required was size to make him a bona fide star. He was 5'6" and 135 pounds at 14. The next year, when he moved to an Oshawa high school and played in the Ontario junior league, he was 5'9" and 25 pounds heavier. By the time his junior career was over - when he was all of 17 and a man playing with boys - he was a sturdy 6' and almost 200 pounds. The phenomenon Boston fans had been reading about since he was a freckle-faced kid with a brushcut was ready to enter the professional game. In his first National Hockey League game, against the Detroit Red Wings and Gordie Howe, 18-year-old Orr impressed the home crowd and the many reporters with his defensive abilities. He blocked shots, made checks and moved opposing players away from the net. He also recorded his first point - an assist. Orr was better than good in his first season. He won the Calder Trophy as the best rookie and also made the NHL's Second All-Star Team. He was second in the league in scoring by defensemen and was a plus-30. Not only did he score and pass, he fought when needed, defeating his opponent more often than not, and could play a physical game. But some observers felt he was too daring, that he left himself open to hits with his all-out rushes and that his body had yet to develop to sustain him over the regular-season grind. Orr did suffer an injury in his rookie season, hurting his left knee on a daring rush. It was the beginning of a long battle with his knees that eventually ended his career. Orr won his first Stanley Cup in 1970 and it was with a flourish only he could manage. His Bruins, a team that hadn't won the Cup in 29 years, were attempting to sweep the St. Louis Blues in the finals. Game four went into overtime. 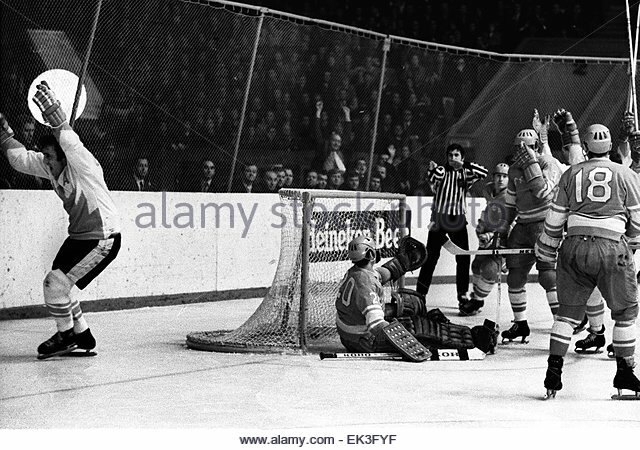 Orr had taken Derek Sanderson's pass from the corner and flashed in front of the net to bury it behind Blues goalie Glenn Hall. As Orr streaked past the net, he was upended by defenseman Noel Picard. Orr jumped, or flew, as he saw the puck beat Hall and the arena erupted. The resulting picture, with Orr's arms raised and his body floating three feet above the ice, was in newspapers and magazines around the world. 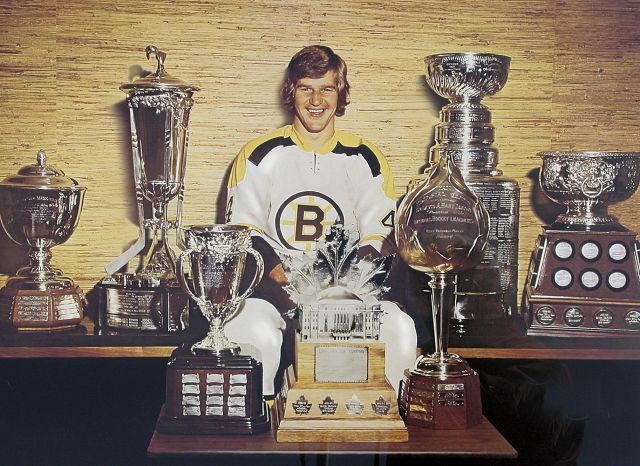 Orr was awarded the Conn Smythe Trophy as the playoffs' most valuable player, an award he would win when Boston again won the title in 1972, again with the Cup-winning goal coming off Orr's stick. Orr revolutionized the sport with his scoring ability and playmaking from the blue line. Other defenders, beginning as early as Lester Patrick in the nascent days of the game, had been offensive threats, but Orr dominated. He won two scoring titles, the only defender to accomplish that feat, and had career season highs of 46 goals and 102 assists. More than just statistics, Orr had the ability to control the game, to take over. He had the speed to float away from defenders and also to recover should he lose possession or get caught on a rush. Often, odd-man rushes in the other team's favour were reversed by his effortless strides. Some argued that he wasn't defensively sound, but hockey people rejected these claims. For eight consecutive seasons Orr won the Norris Trophy as the best defenseman and three times he was the league's most valuable player to collect the Hart Trophy. Orr's plus-minus rating when he was at his best was untouchable at plus-124 in 1970-71, when he scored 139 points. 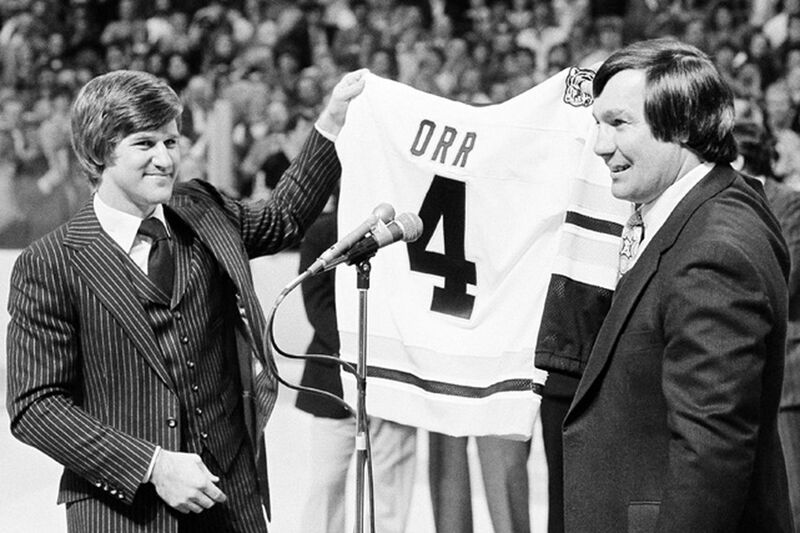 At the beginning of the 1971-72 season, Orr signed a contract that guaranteed him $200,000 per season over five years. It was the first $1 million deal in hockey and Orr's agent, Alan Eagleson, predicted at the time that Orr would someday own part of the team if he continued to star for Boston. As it turned out, when it came time to negotiate a new contract prior to the 1976-77 season, the Bruins did offer Orr a piece of the ownership but the star player said his agent never informed him of the proposed deal. Orr, who had struggled with his left knee and played only 10 games in 1975-76, felt as though Boston no longer wanted him and signed instead with the Chicago Black Hawks. Once considered the saviour and then the hero of the rejuvenated Bruins, Orr left the team that had been a part of his career since he was a teen in Parry Sound. 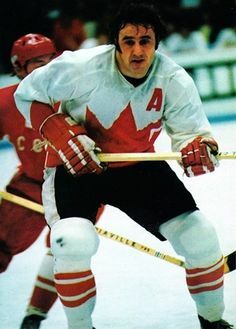 Orr took advantage of a chance to play in a major international competition - the 1976 Canada Cup - when Chicago management gave him permission to play. 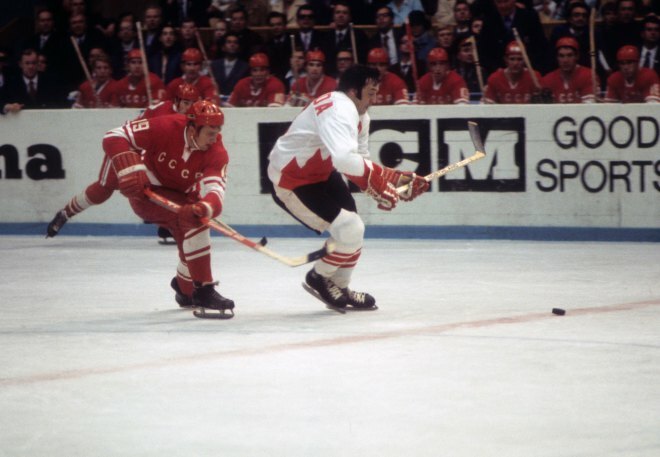 Having missed all of the Summit Series, the Canada Cup proved to be Orr's only major appearance in a competition against the best the world had to offer. He was outstanding in the Canadian team's run to the championship. He was co-leader of the team in scoring, finishing the seven games tied with another great defender, the New York Islanders' Denis Potvin, with nine points. Orr was selected to the tournament All-Star team and capped the experience with the most valuable player award. Orr's performance at the Canada Cup had the Chicago faithful energized for his first appearance in colours other than Bruins black and gold. But Orr's left knee would once again impede his career. He played 20 games of his first season in Chicago weakened by his sixth operation on the knee in April 1976. He spent the entire 1977-78 season recuperating, trying to revive his battered knee, which doctors described as nothing but bone rubbing bone after so many operations and injuries. He made a valiant attempt to return, playing six games at the start of the 1978-79 season. Though Orr didn't feel incredible amounts of pain, he was limited in his movements and unable to practise much with the team. In one game against the Detroit Red Wings, he was on the ice for four Detroit goals and described his play as "terrible." At the age of 30, he decided he was only hindering his Chicago squad. Howard Cosell, the legendary sportscaster, announced in October 1978 that Orr had retired, though it later turned out he had mistaken Orr for Bobby Hull, who was also contemplating leaving the game. A few days later, Orr called Cosell and told him he was indeed retiring and asked him to attend the press conference. Cosell refused, jokingly saying that he didn't "cover old news." Because of his continuing problems, Orr had never collected a paycheck from the Black Hawks. He said he was paid to play hockey, and after his retirement he accepted a reduced salary to become an assistant coach, a position he had filled while sitting out the year before. 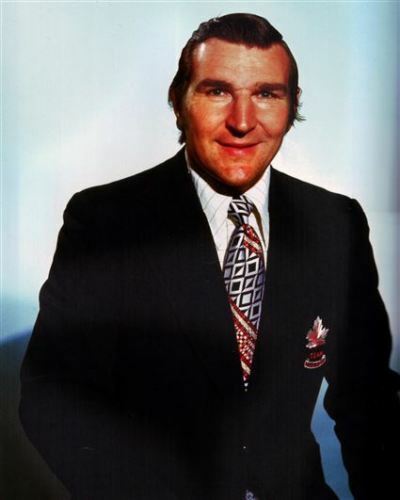 Orr was inducted into the Hockey Hall of Fame in 1979. He worked frequently with charities in the coming years and maintained close links with the game. He later became an agent, helping young players benefit by sharing his difficult early experiences through the business side of the sport. 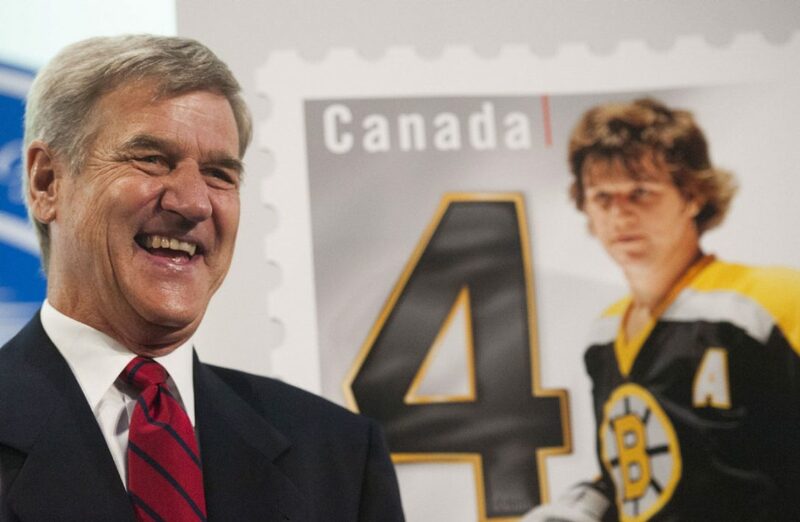 In 2003, the Bobby Orr Hall of Fame opened in his hometown of Parry Sound, Ontario. March 21, 1974: Boston's Bobby Orr scores three goals for his fifth NHL hat trick and reaches the 30-goal mark after promising a gravely ill 16-year-old boy he will score a goal for him. The Bruins defeat the St. Louis Blues 7-0 at Boston Garden. March 22, 1964: Eddie Johnston of the Boston Bruins becomes the last goalie in NHL history to play every minute of every game in a season. As is the case in each of Boston's first 69 games, Johnston is in goal for the Bruins' season finale against the Chicago Blackhawks. And as is usually the case, he loses; the Blackhawks score four times on 40 shots and hold off the Bruins for a 4-3 victory at Boston Garden. The loss leaves Johnston with a record of 18-40-12 and a 3.01 goals-against average in 70 games for the last-place Bruins. March 22, 1970: Boston's Bobby Orr sets two marks by scoring two goals and assisting on two others a 5-0 win against the visiting Minnesota North Stars. Orr scores late in the first period and again with 1:03 remaining in the third; the second goal makes him the first defenseman in NHL history to score 30 in a season, The two assists give Orr 78, surpassing the NHL single-season record of 77 set by teammate Phil Esposito in 1968-69. March 26, 1980: Tony Esposito of the Chicago Blackhawks becomes the first goaltender in NHL history with eight 30-win seasons. Esposito's milestone victory comes in a 7-2 road victory against the Quebec Nordiques, the Blackhawks' first win in Quebec. It also comes 10 years to the day after Esposito breaks Harry Lumley's 16-year-old "modern" record with his 14th shutout of the season in a 1-0 victory against the Detroit Red Wings. 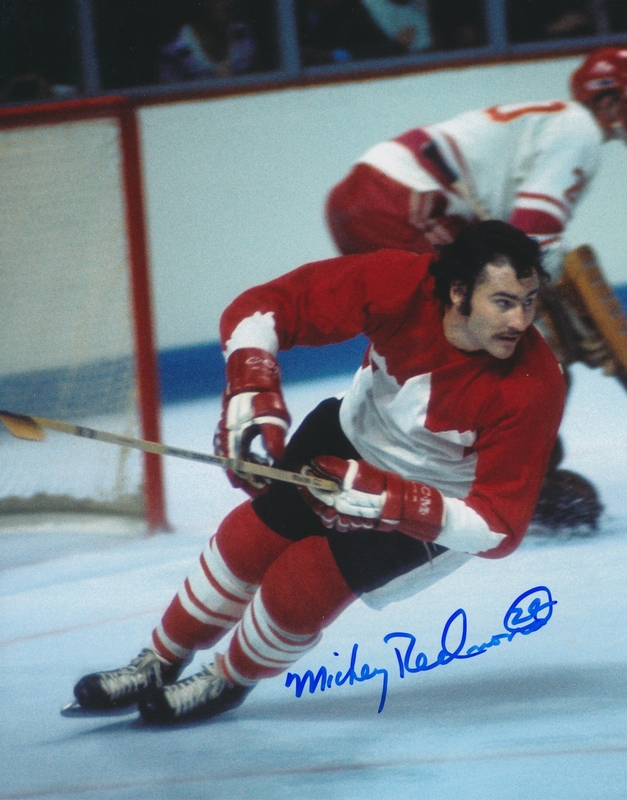 March 27, 1973: Mickey Redmond becomes the first 50-goal scorer in the history of the Detroit Red Wings when he scores twice in an 8-1 win against the Toronto Maple Leafs at Maple Leaf Gardens. Redmond is the seventh NHL player to reach the 50-goal plateau, joining Maurice Richard and Bernie Geoffrion of the Montreal Canadiens as well as Phil Esposito and Johnny Bucyk of the Boston Bruins, Bobby Hull of the Chicago Blackhawks and Vic Hadfield of the New York Rangers. Redmond scores his 50th at 16:47 of the third period, beating Toronto goaltender Ron Low, then scores his 51st at 17:05. He breaks the Red Wings record of 49 goals held by Gordie Howe and Frank Mahovlich. "I must admit, I didn't even see the puck," Redmond said of his 50th, a deflection of a shot by defenseman Gary Bergman. "I just saw the goalie look behind him and I knew I must have got it." March 28, 1967: Chicago center Stan Mikita and Detroit forward Gordie Howe each makes history in the Blackhawks 7-2 win against the Red Wings at Chicago Stadium. Mikita gets his 60th assist of the season, breaking his own single-season record of 59, set in 1964-65. Howe becomes the first player in NHL history to reach 1,500 points when he assists on a goal by Bruce MacGregor midway through the first period. March 29, 1973: Philadelphia Flyers center Bobby Clarke becomes the first player from an expansion team to score 100 points in a season. His 100th point is a goal that helps the Flyers defeat the Atlanta Flames 4-2 at the Spectrum. March 29, 1970: Chicago Blackhawks rookie goaltender Tony Esposito gets his 15th shutout of the season, an NHL record for rookie goalies, in a 4-0 win against the Toronto Maple Leafs at Chicago Stadium. Esposito, claimed from the Montreal Canadiens in the intraleague draft, wins the Calder and Vezina trophies as the League's outstanding rookie and goaltender. The 15 shutouts are the most by any goalie since 1929. March 30, 1969: Pat Stapleton of the Chicago Blackhawks ties an NHL single-game record for defensemen with six assists in a 9-5 win against the Detroit Red Wings. Stapleton also becomes the first defenseman in League history to be credited with 50 assists in one season. March 30, 1976: Center Jean Ratelle reaches the 100-point mark when he scores a goal and has two assists for the Boston Bruins in a 4-4 tie against the Buffalo Sabres at Boston Garden. Ratelle, acquired from the Rangers on Nov. 7, 1975, becomes the first NHL player to have 100 points while playing for two teams in the same season. April 2, 1972: On the same day, Vic Hadfield becomes the first player in Rangers history to score 50 goals in a season. Hadfield, playing with a broken thumb, reaches the mark when he beats Denis DeJordy of the Montreal Canadiens for his second goal of the game at 14:46 of the third period at Madison Square Garden. Hadfield gets an ovation from the packed house at the Garden. April 3, 1971: Boston defenseman Bobby Orr sets up three goals in an 8-3 win against Toronto at Maple Leaf Gardens to become the first player in NHL history to have 100 assists in one season. 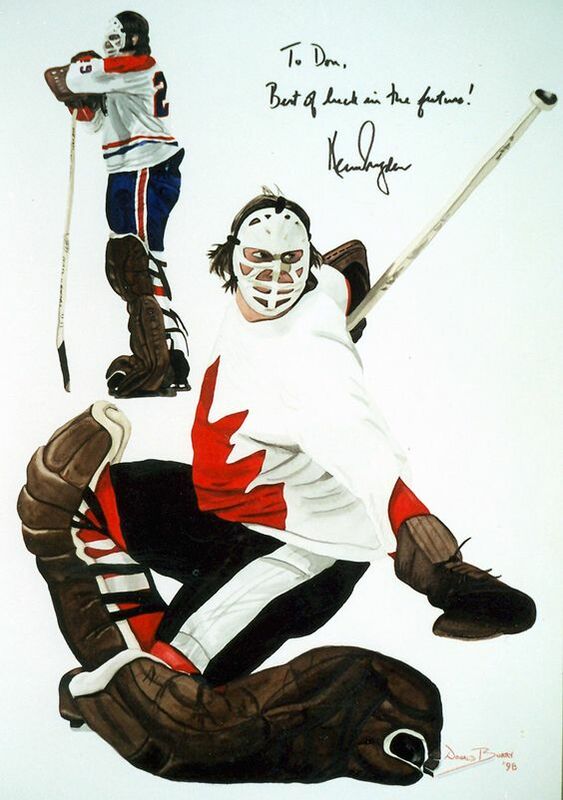 April 4, 1979: Montreal's Ken Dryden becomes the first goaltender to win at least 30 games in each of his first seven NHL seasons. Dryden gets his 30th and final win of the 1978-79 season in the Canadiens' 4-1 victory against the Red Wings at the Forum. He retires a few weeks later after helping the Canadiens win the Stanley Cup for the fourth consecutive year. April 5, 1980: Marcel Dionne wins his only NHL scoring title by getting two assists in the Los Angeles Kings' 5-3 loss to the Vancouver Canucks. Dionne finishes the season with 53 goals and 137 points. Edmonton Oilers' Wayne Gretzky also has 137 points, but Dionne wins the Art Ross Trophy because he scores two more goals. April 5, 1970: Bobby Orr has a second-period assist in the Boston Bruins' final game of the season, a 3-1 win against the Toronto Maple Leafs at Boston Garden, to become the first defenseman to lead the NHL in scoring. Orr finishes with 120 points (33 goals, 87 assists) in 76 games. April 11, 1971: Bobby Orr of the Boston Bruins becomes the first defenseman since 1922 to have a hat trick in the Stanley Cup Playoffs. Orr scores three goals in a 5-2 win against the Montreal Canadiens at the Forum in Game 4 of the Quarterfinals. He ties the game 1-1 midway through the second period and scores twice in the third to help the Bruins even the series at two wins each. April 11, 1975: The New York Islanders establish their own identity by stunning the New York Rangers when J.P. Parise scores 11 seconds into overtime for a 4-3 victory in the third and deciding game of their Preliminary Round series at Madison Square Garden. Parise jams a pass by Jude Drouin from the right corner past Ed Giacomin before many of the fans at the Garden have returned to their seats after intermission. It's the fastest overtime goal in playoff history, a mark that stands until 1989. Islanders general manager Bill Torrey later says Parise's goal is more important to the organization than the overtime goal by Bobby Nystrom that won the Stanley Cup in 1980. "That goal put us on the map," Torrey recalls years later. April 19, 1962: Two future Hockey Hall of Fame members, defenseman Tim Horton and center Stan Mikita, set Stanley Cup Playoff records in Toronto's 8-4 victory against the Chicago Blackhawks in Game 5 of the Final at Maple Leaf Gardens. Horton, not known for his offense, assists on three of Toronto's goals, giving him 15 points, a record for defensemen in one playoff year. Mikita sets up two second-period goals to break Gordie Howe's single-season record with 21 points. His 15 assists are also a record for one playoff year. 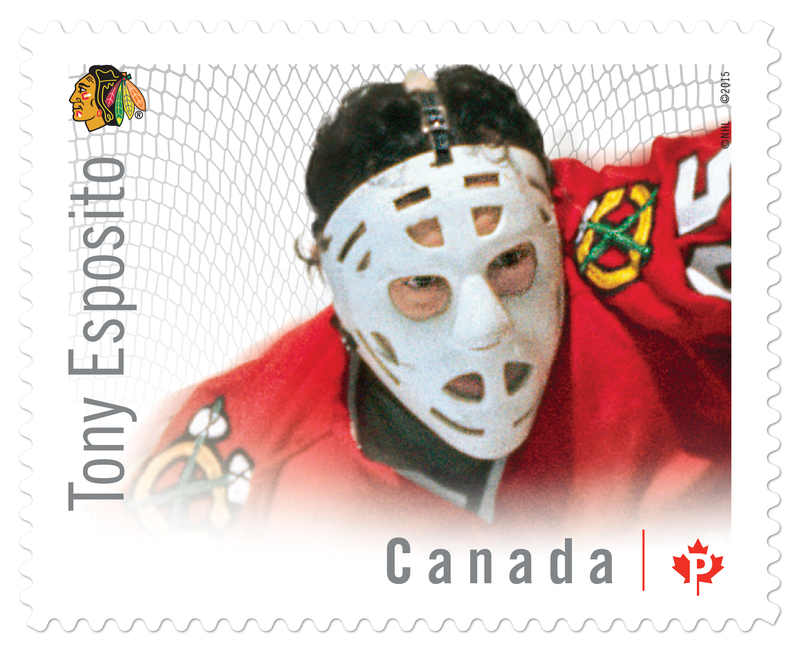 As one half of perhaps the most colorful brother act in NHL history, Tony "0" revolutionized goaltending in the NHL with his legs-open "butterfly" style and his spectacular flop-on-the-ice saves during the 16 years he spent in the league, all except one with the Chicago Black Hawks. As the younger brother of scoring star Phil, Tony had something to prove when he entered the league in 1968. After a collegiate career with the Michigan Tech Huskies and the Vancouver Canucks of the Western Hockey League, he spent time with Houston of the Central Hockey League. His first partial year with Montreal was unspectacular - the Canadiens had Gump Worsley and Rogie Vachon ahead of him - but after being traded to Chicago, he was impressive in his first full season, recording a Calder and Vezina Trophy-winning year in 1969-70 with a 2.17 goals-against average and a modern-era record of 15 shutouts. 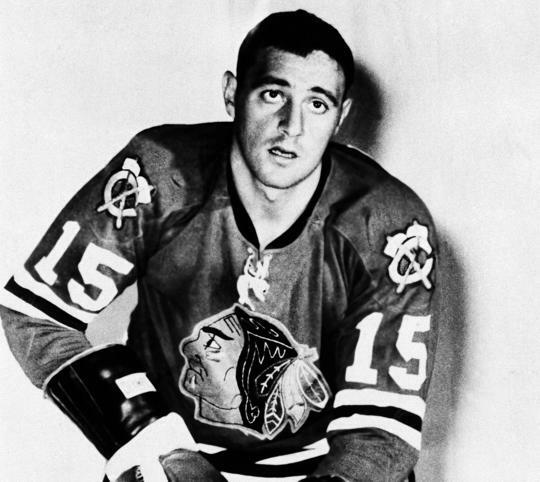 Fans of the game were quick to point out that the Hawks under coach Billy Reay were a defensive-minded squad and that at 5'11" and 190 pounds, Esposito was a stocky, very mature 26-year-old rookie. But more important, he was fast gaining a reputation as having the quickest glove hand in the game and an unorthodox style that was confounding but nevertheless extremely effective. The Vezina win in his first year made him the first rookie to win the trophy since Frank Brimsek in 1939. Even so, Tony was good enough between the pipes to win a scholarship to Michigan Tech, graduating in three years with a business degree and attaining all-American status each year. As a pro, he quickly gained a reputation as an emotional, vocal goalie who would yell regularly at his defensemen and stay well back in his crease except when he came out to poke-check skaters. He added to his rookie Vezina win by sharing the trophy with Gary Smith in 1972 and tying Bernie Parent in 1974. In his career, he totaled 76 regular-season shutouts. Incredibly, the Black Hawks never failed to make the playoffs while Esposito was on the team. Internationally, he was a standout as well. 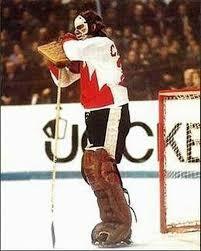 In 1972 he shared the goaltending role with Ken Dryden on Team Canada in the Summit Series. And in 1981 he tended goal during the Canada Cup, but this time for Team USA, his country of residence. Later in his career, Esposito began to gain a reputation as one of the grand old men of the NHL. But it wasn't always easy. By the early 1980s, he'd become dissatisfied with the way his teammates were performing in Chicago. But by 1982, with Tony's help, the Hawks turned their game around again. As the oldest player in the league, Tony started to play like he was a decade younger in the 1982 playoffs, with a goals-against average under 2.00. By 1983-84, Tony was the oldest player in the league and the only one over 40 years of age. Observers started to notice that while he was once the type of player who insisted on playing every minute of every game, he wisely realized that, at his age, he had to pick his spots and he happily shared the goalie's duties with backup Murray Bannerman. But it was eventually time for Tony "0" to hang up the big pads and he was released by the Hawks in 1984. He wasn't long out of the pro game, though, before the Pittsburgh Penguins made him director of hockey operations. After his time in Pittsburgh, Tony joined brother Phil in the front office of the expansion Tampa Bay Lightning. He was inducted into the Hockey Hall of Fame in 1988. But he will be best remembered as one of the true pioneers among netminders in the NHL. 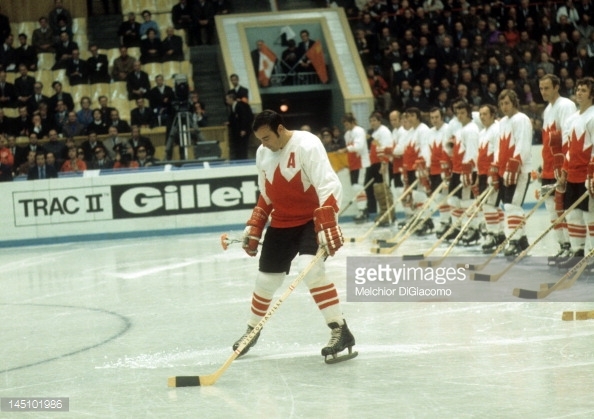 © 1972 Summit Series Hockey Team Inc. All Rights Reserved.